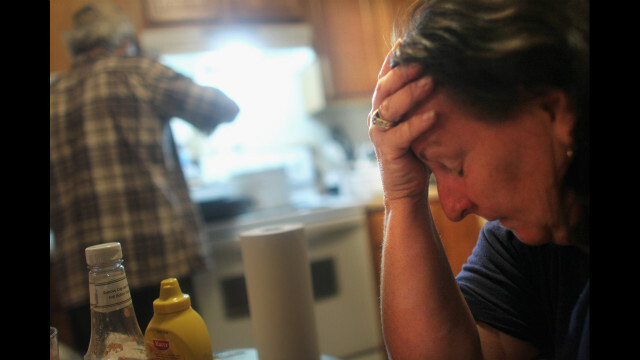 Melanie and Philip Martinez Sr. have dinner in daughter Kala's one-bedroom apartment on Saturday, September 8, in Chalmette, Louisiana. Melanie, along with her husband and mother, are staying in Kala's apartment after their home in Braithwaite flooded during Hurricane Isaac. It was the fifth home Martinez has lost to hurricanes in Louisiana. 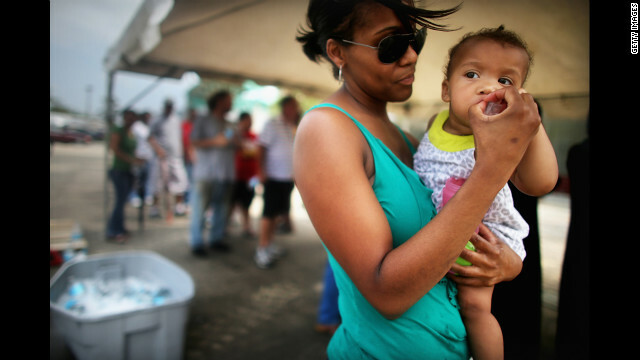 Melanie Martinez, center, waits in line to apply for disaster food assistance in Mereaux, Louisiana. 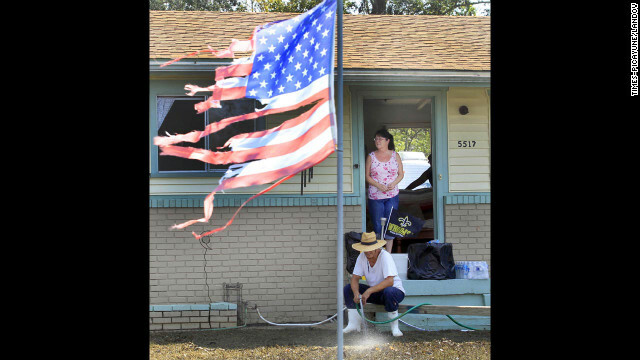 On Friday, September 7, Gina Hunter walks past the front porch of her home, which washed onto a levee in Plaquemines Parish in Braithwaite, Louisiana. "I never expected to have the levee as my backyard," Hunter says. 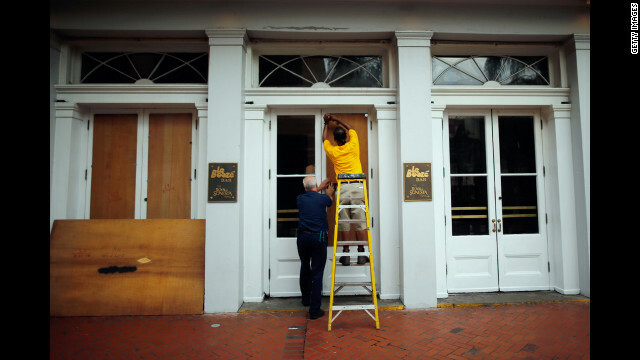 Louisiana officials estimate at least 13,000 homes were damaged by Hurricane Isaac. 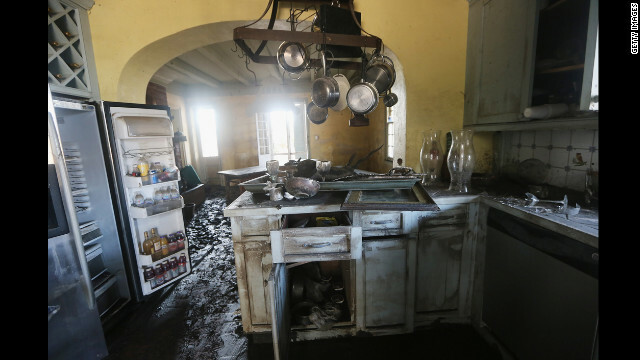 Mud coats the kitchen of the flooded Mary Plantation House, the oldest structure in Louisiana's Plaquemines Parish, on Thursday, September 6. 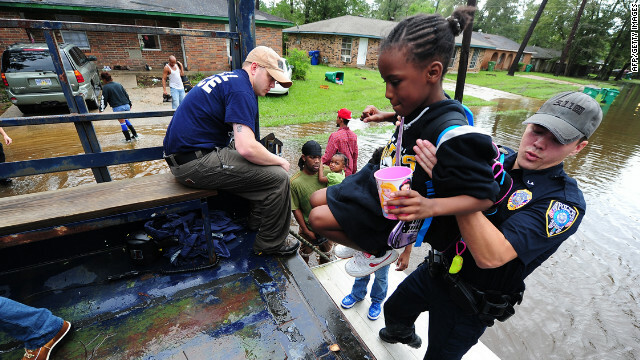 At least 13,000 homes were damaged throughout Louisiana after Hurricane Isaac came ashore last week, a state official estimates. 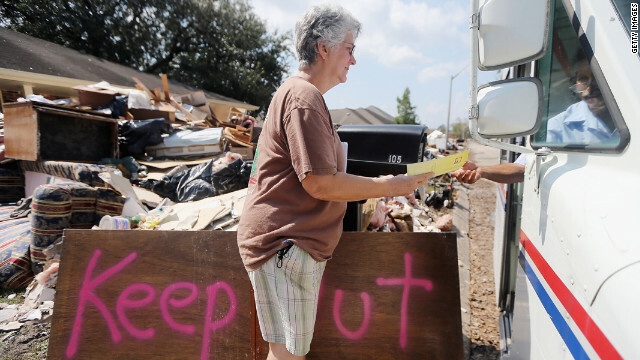 Marie Hauser picks up her mail outside her flooded house Thursday in LaPlace, Louisiana. Blake Miller, right, and Mike Atkins check out the grounds of the Mary Plantation House on Thursday. 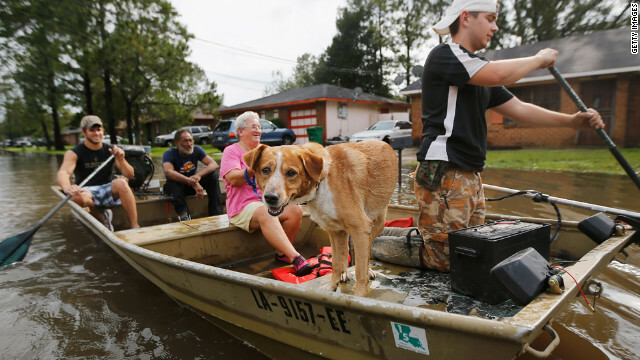 Floodwaters linger Thursday in Braithwaite, Louisiana. Worker Holly Rochelle sorts a resident's laundry, washed for free at the Tide Loads of Hope mobile laundromat set up for those affected by Isaac, on Thursday in LaPlace. 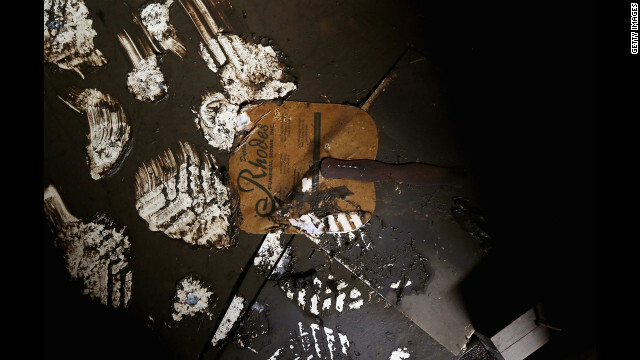 A paper hand fan sits caked in mud from flooding at Bethlehem Baptist Church in Plaquemines Parish on Wednesday, September 5. 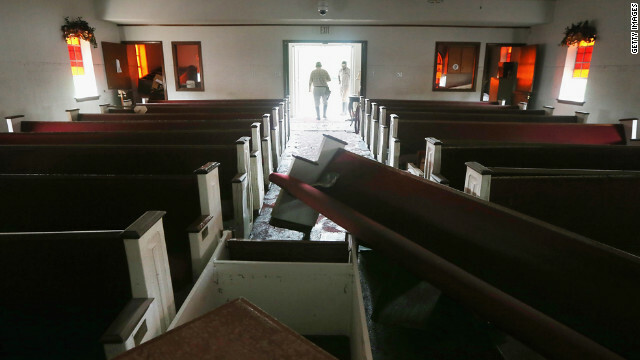 An insurance inspector tours the damaged Bethlehem Baptist Church on Tuesday. 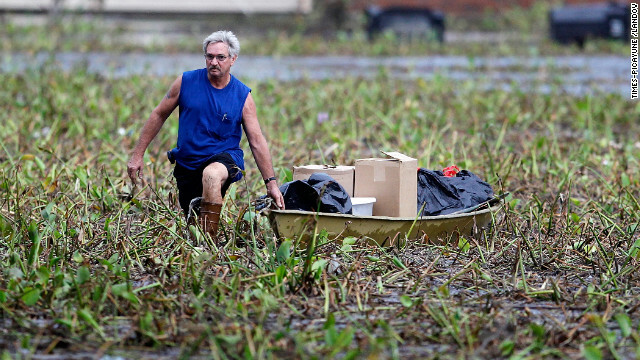 Richard Williams of the Braithwaite neighborhood in Plaquemines Parish, Louisiana, trudges through a debris field pulling a boat filled with things from his flooded home on Wednesday. 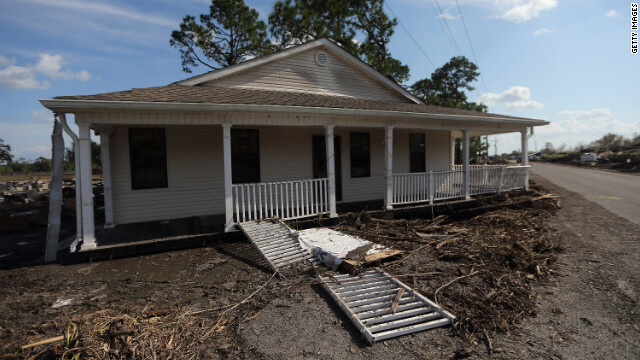 Hurricane Isaac inundated his two-story home. Fred Leslie is helped into a boat by Jesse Shaffer after he and his half-brother made their way to the house to retrieve items on Wednesday. The Braithwaite neighborhood is still under four feet of water eight days after Hurricane Isaac hit. Ruth Bernard feeds ice to Micah Faciane to stay cool as they wait in line to apply for disaster food assistance on Wednesday in Westwego, Louisiana. 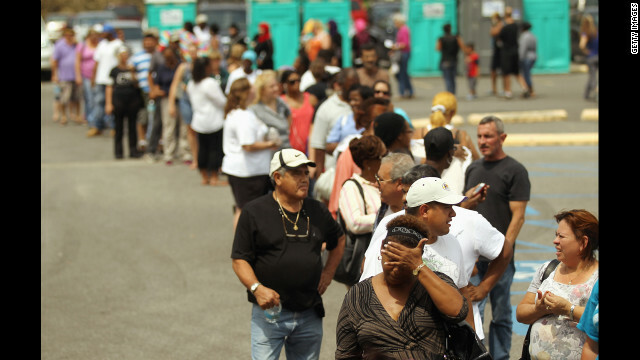 Hundreds affected by Hurricane Isaac waited hours in the heat to apply for the Disaster Supplemental Nutrition Assistance Program. 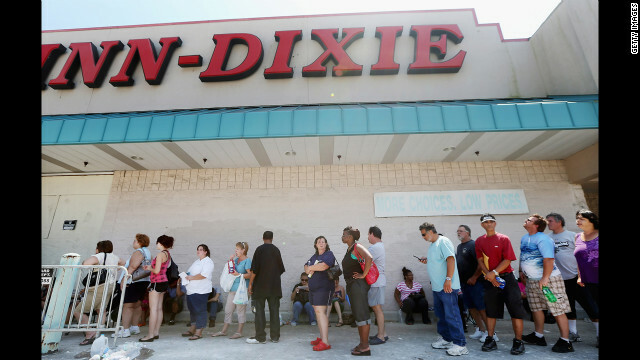 Residents wait in line to apply for disaster food assistance on Wednesday in Westwego, Louisiana. 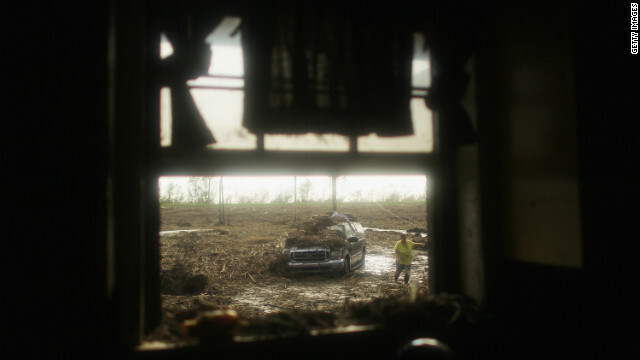 Louis Lipps tries to salvage belongings near his house on Lake Pontchartrain in LaPlace, Louisiana, on Tuesday, September 4. Many residents returning to their homes in southern Louisiana after Hurricane Isaac will find little comfort. Authorities have blamed eight U.S. deaths on Isaac, six of them in Louisiana, after it made landfall last week as a Category 1 hurricane. 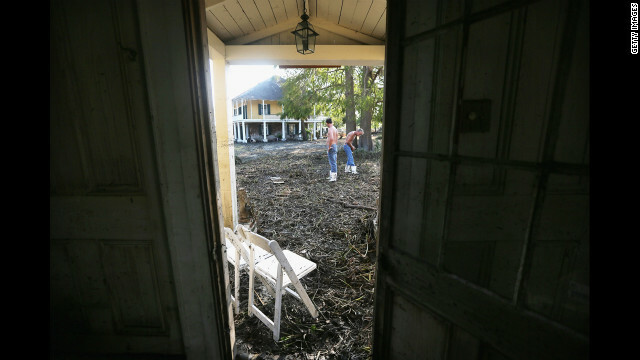 Royal Ann Moll stands in the doorway of her home in Jean Lafitte, Louisiana, as friend Tilden Perez Jr. tries to spray away mud from the front yard Tuesday. 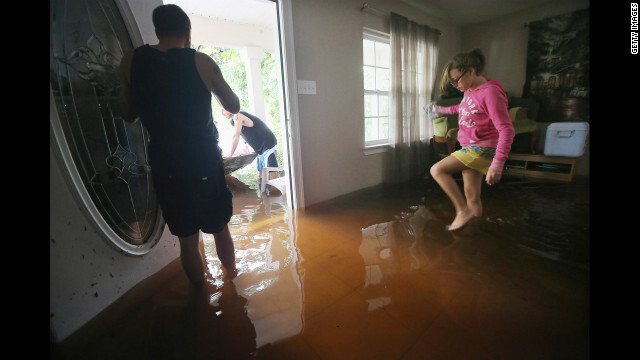 Perez and his wife rode out the storm in Moll's house, which took on about 11 inches of water. 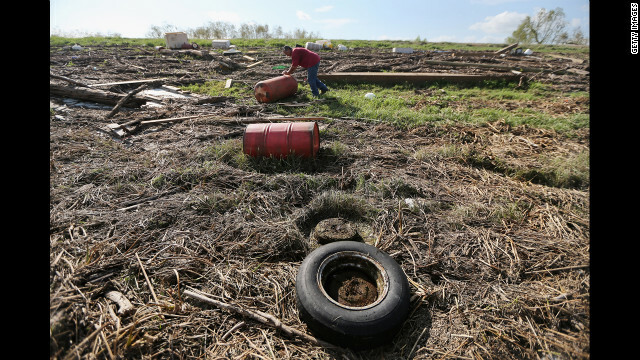 Joe Chianelli Jr. retrieves a gas tank Tuesday that washed onto a levee in Plaquemines Parish in Braithwaite, Louisiana, during the storm. 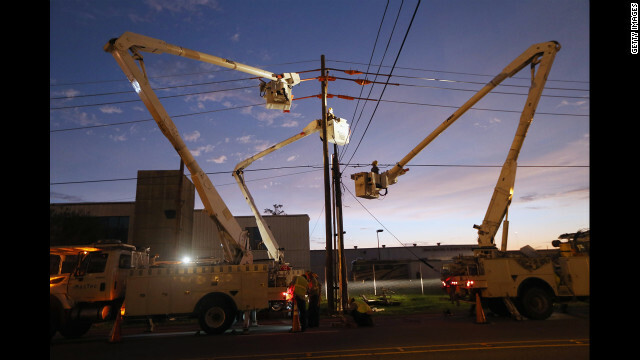 Utility crews work to restore electricity Tuesday in Harvey, Louisiana. 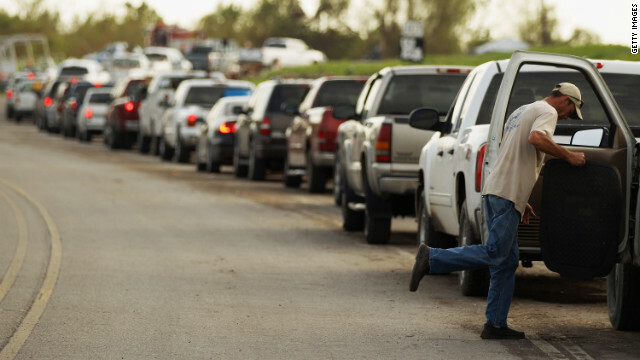 Returning residents wait in line Tuesday for a ferry in Plaquemines Parish. 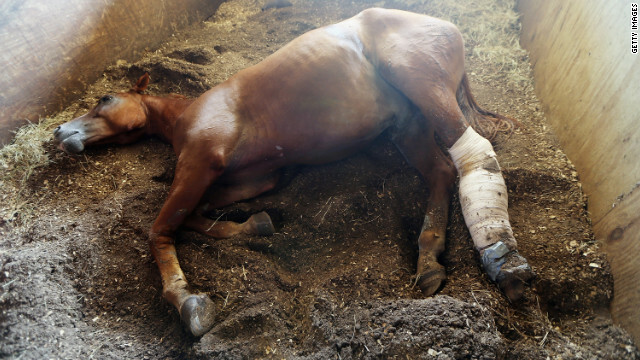 A wounded horse recovers Tuesday in Poydras, Louisiana, after being rescued when it got stuck in mud from storm flooding. A home washed away from its foundation sits on a roadside Tuesday in Braithwaite in Plaquemines Parish. 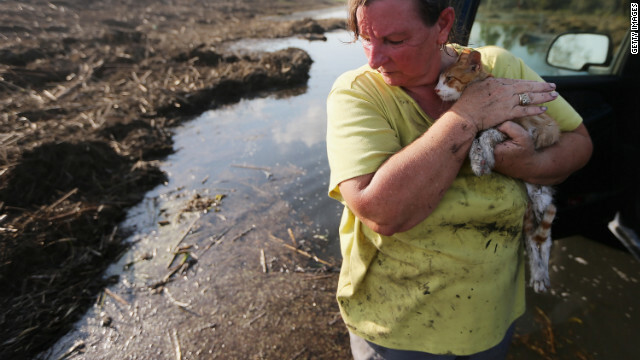 Melanie Martinez holds the family cat, now renamed Isaac, after salvaging items from her family's flooded home in Braithwaite on Monday, September 3. 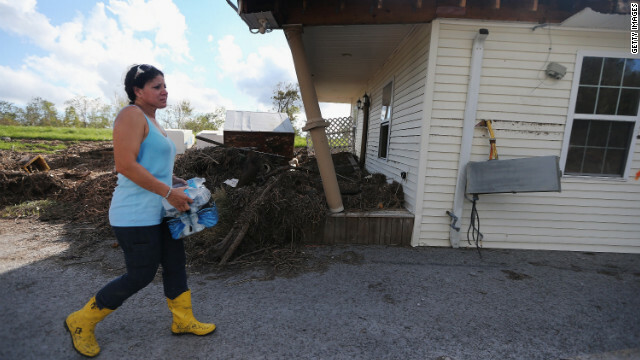 Martinez, along with her husband and her mother, was forced to ride out the storm in their Plaquemines Parish home when their car broke down. Melanie Martinez walks through the front yard Monday as family members salvage items from their flooded home in Braithwaite, Louisiana. 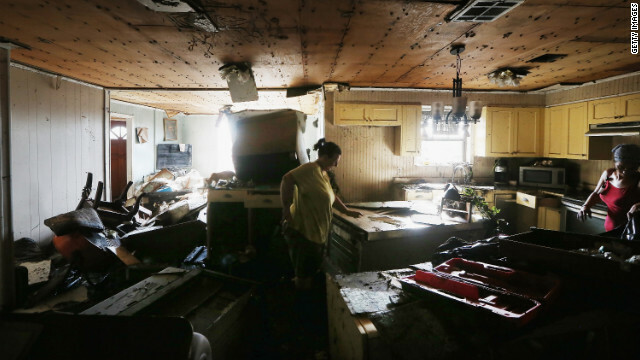 Melanie Martinez, left, and family members salvage items from their flooded home Monday. 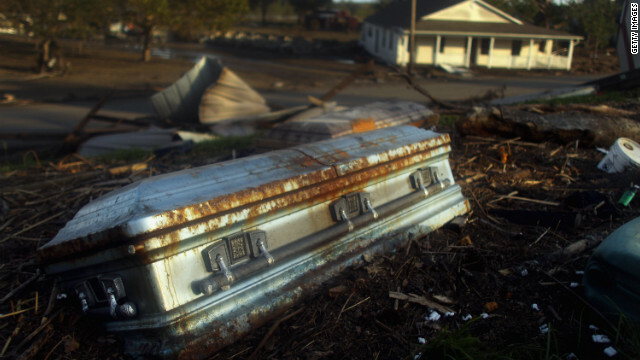 A coffin lies on the side of a levee Monday in Braithwaite, Louisiana, washed up by floodwaters from Hurricane Isaac. 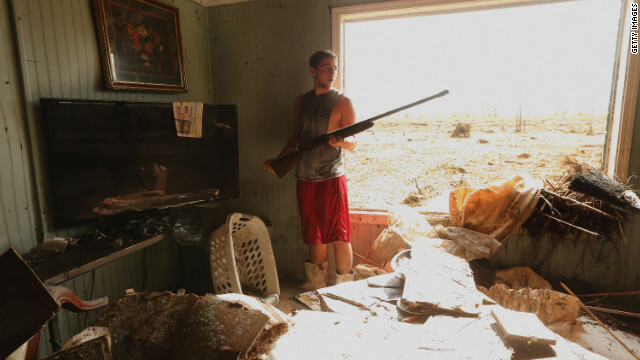 Eric DeSalvo salvages a gun Monday from the flooded Martinez home in Braithwaite, Louisiana. Melanie Martinez, center, and Kala Martinez salvage items from their flooded home on Monday. 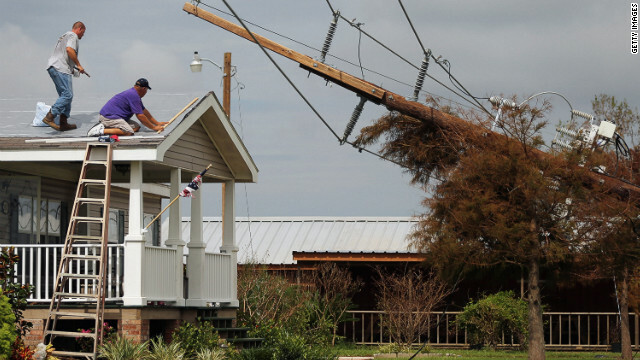 Workers repair the roof of a home as downed power lines caused by Hurricane Isaac lean onto a tree in lower Plaquemines Parish on Sunday, September 2. 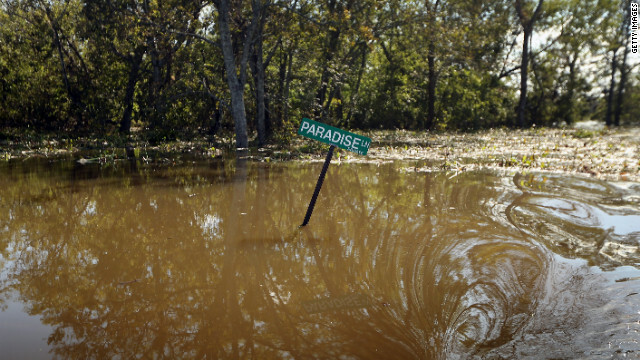 A Paradise Lane street sign is partially submerged in Isaac's floodwaters in Braithwaite, Louisiana, on Saturday, September 1. 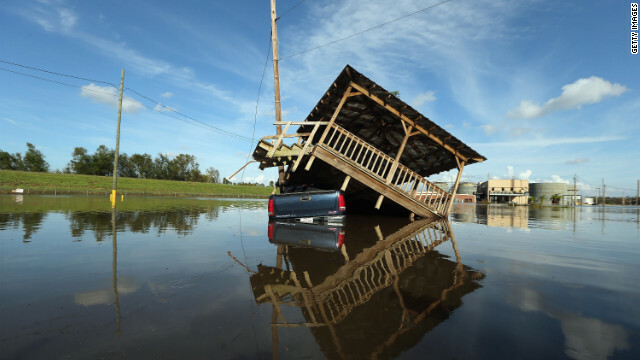 A damaged structure rests atop a partially submerged truck in Braithwaite, Louisiana. 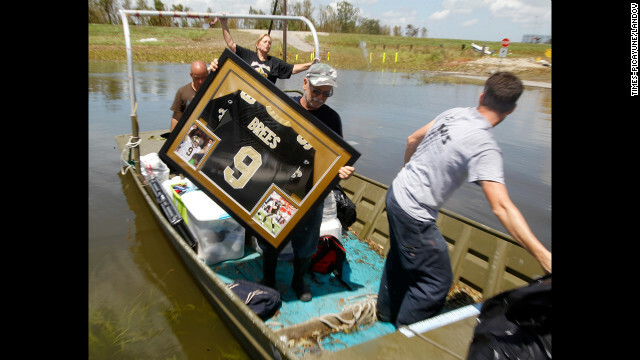 Russell Wilson, center, helps to move a water-damaged Drew Brees jersey from his daughter's home in Braithwaite. 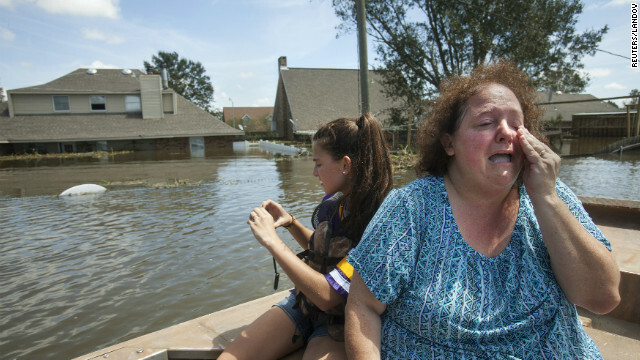 Plaquemines Parish resident Angela Serpas reacts after seeing her flooded home for the first time following Hurricane Isaac, as her daughter Lainy takes pictures, in Braithwaite, Louisiana, on Saturday, September 1. The Walker family leaves their home after an abandoned house next door collapsed onto theirs during Tropical Storm Isaac on Friday, August 31. The Red Cross was assisting the family in finding a place to stay. 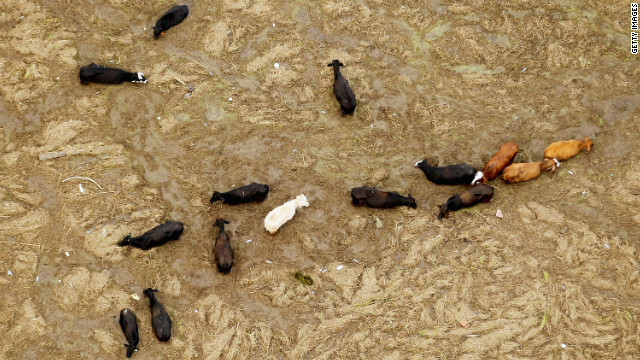 Cattle are stuck in a mixture of mud and debris washed in by Isaac's storm surge. Officials are attempting to conduct a roundup in Plaquemines to save about 200 cattle stranded by the storm. Local residents serve up chicken etouffee and rice delivered by the Louisiana National Guard at JJ's Bar in the Bywater neighborhood of New Orleans. 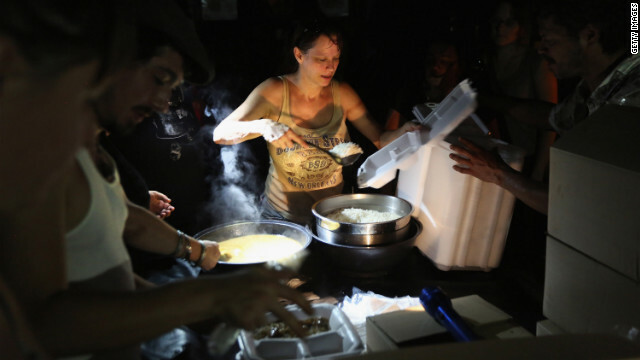 The military gave out the food to residents of the area, which was still without electricity three days after Hurricane Isaac knocked out power to hundreds of thousands of people. 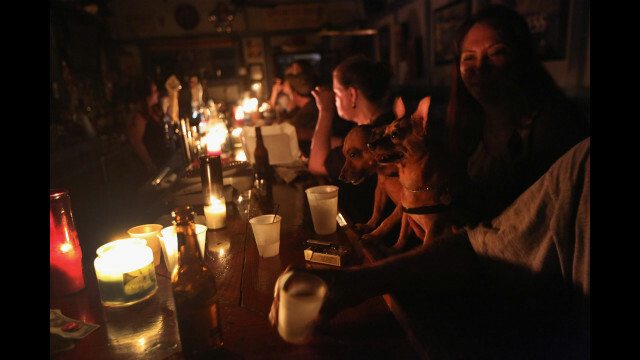 Local residents drink by candlelight at JJ's bar during the continued blackout. 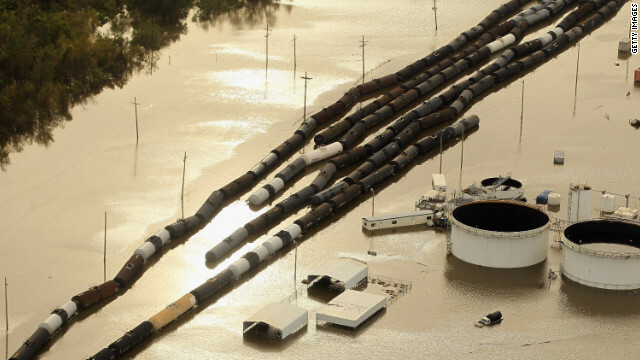 Oil containers and railroad cars sit in Isaac's flood waters in Braithwaite, Louisiana. 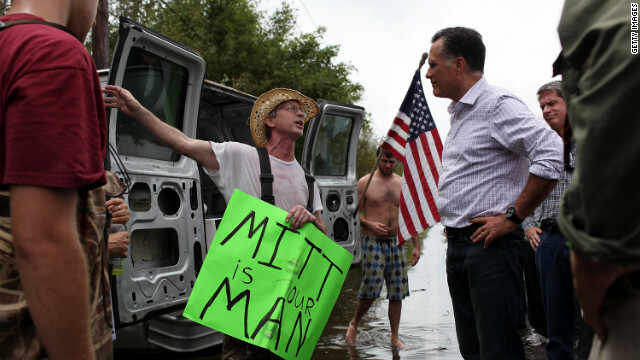 Republican presidential candidate Mitt Romney talks with a man on the side of the road while on an unscheduled tour of a neighorhood damaged by Isaac on Friday, August 31, in Lafitte, Louisiana. 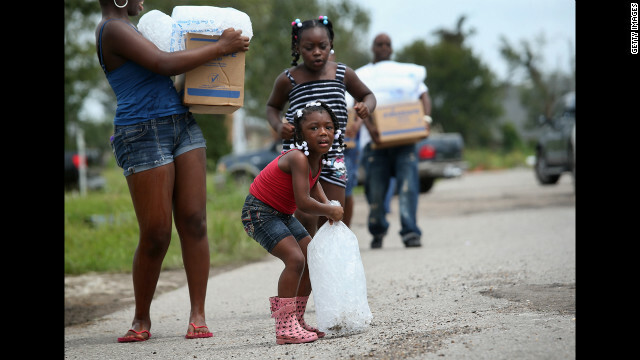 A family carries bags of ice and boxes of food from an aid distribution center for victims of Isaac in New Orleans. The center was one of three in the city operated by the military, offering handouts to residents, many of whom still have no electricity due to the storm. 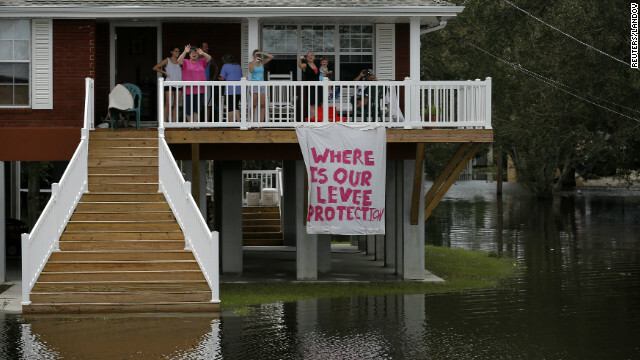 Residents look out from their residence surrounded by water as the motorcade of Romney passes during a tour of damage from Isaac in Lafitte. 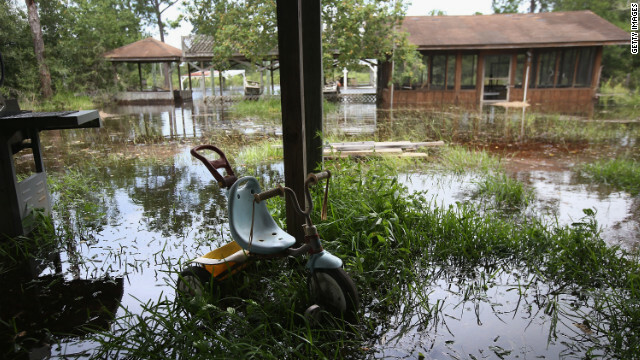 Flood waters from Tropical Storm Isaac swamp homes in Braithwaite, Louisiana, on Friday, August 31, 2012. 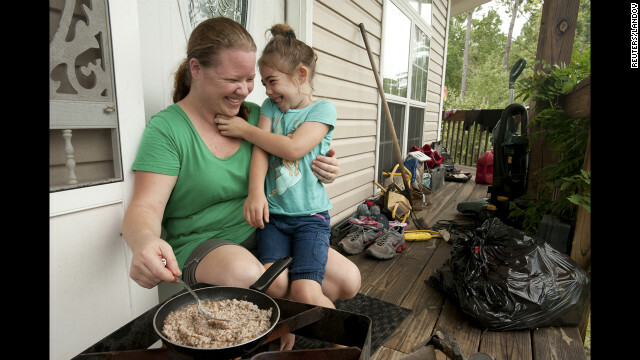 Vivian Lane, 5, helps her mother, Ashley Lane, make rice and gravy on their porch after Hurricane Isaac knocked out their power in Bay Saint Louis, Mississippi, Friday. 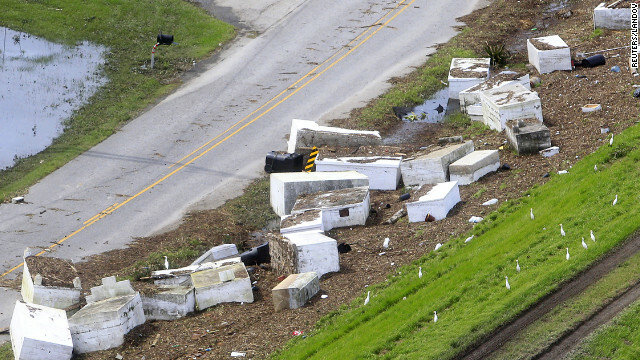 Tombstones washed from their resting place by flood waters from a levee breach in Braithwaite, Louisiana, on Friday. 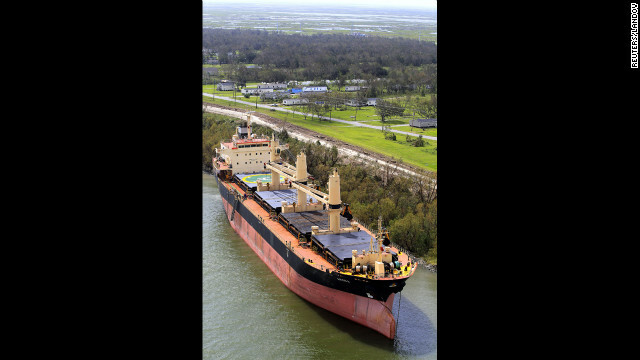 The ship Arosa Basel sits grounded on the east bank of the Mississippi River in Plaquemines Parish, Louisiana, Friday. 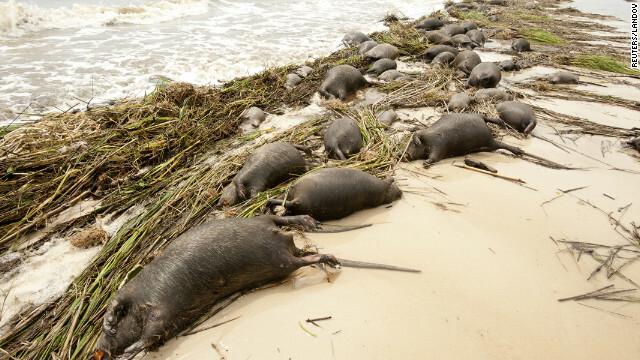 Dead nutria lie on the shore near Waveland, Mississippi, on Friday. 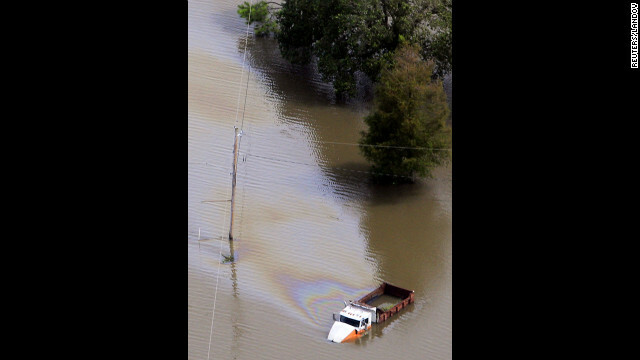 A truck, partially submerged by a levee breach, gives off a sheen of oil and fuel in Braithwaite, Louisiana, on Friday. 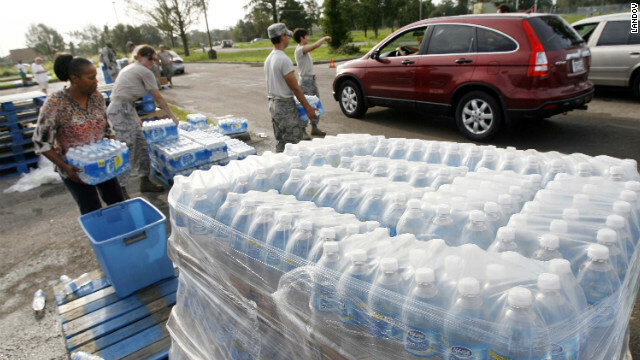 Members of the Louisiana Army National Guard and Louisiana Air National Guard distribute water, MREs and ice at Skelly-Rupp Stadium in New Orleans on Friday. 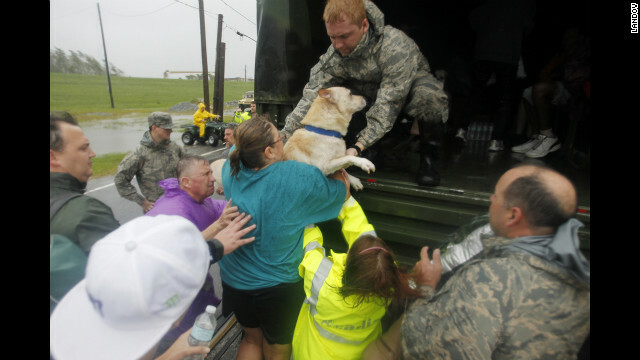 Jewel Rico and her dog Chico are rescued from flood waters from Isaac on Thursday, August 30, in Reserve, Louisiana. 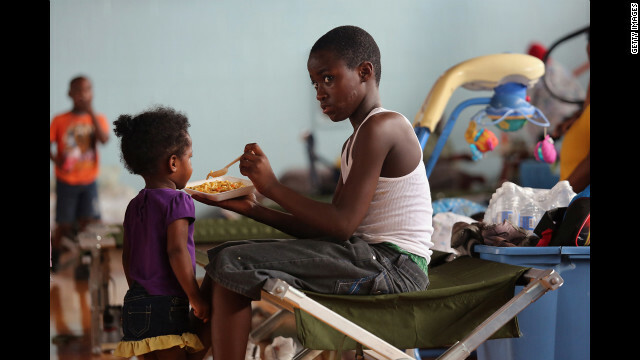 Darrell Hill, 11, feeds his sister Floy Dillon, 2, at a flood shelter set up in a high school gym. 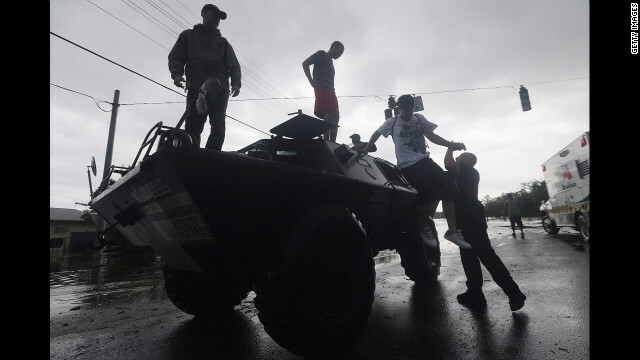 People get off a Slidell Police Department SWAT vehicle after being rescued from flooding from Isaac's storm surge on the north shore of Lake Pontchartrain. 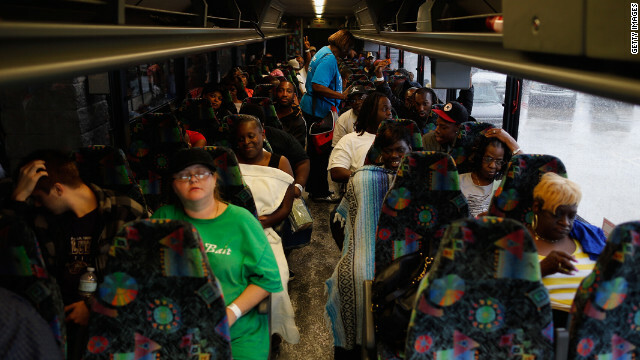 Residents sit on a bus Thursday after evacuating Laplace, Louisiana. 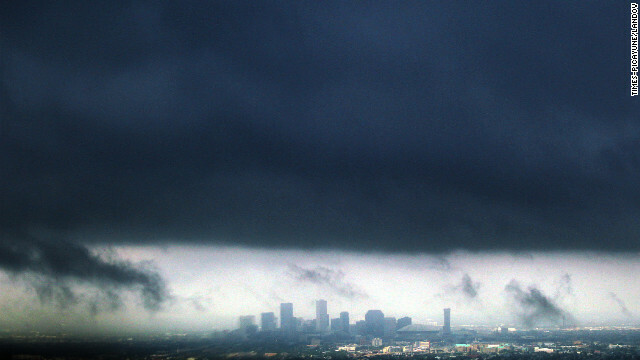 A heavy band of storms hovers ominously over New Orleans in the aftermath of Isaac on Thursday. 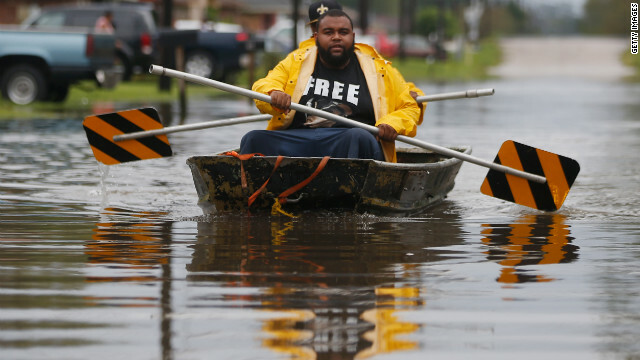 Two men paddle a boat with street signs in flood waters from Hurricane Isaac in Reserve, Louisiana. 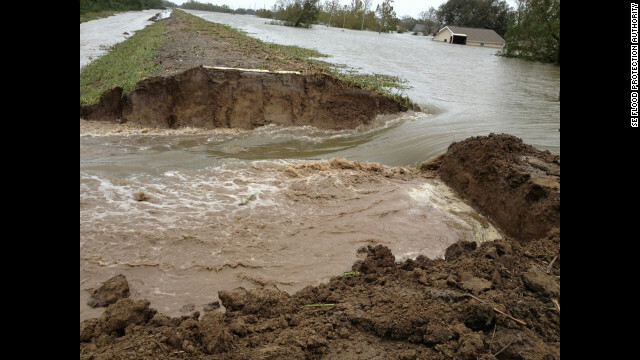 Subdivisions in LaPlace, west of U.S. 51 and south of Interstate-10 are covered in floodwaters in the aftermath of Isaac. The Lake Borgne Basin Levee District and other government agencies intentionally breached the Caernarvon Diversion to help drain flood waters in Plaquemines Parish, Louisiana. 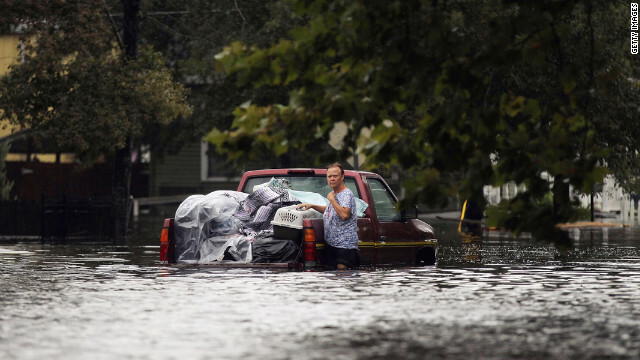 A woman is stranded with her truck in floodwaters from Isaac on the north shore of Lake Pontchartrain on Thursday in Slidell, Louisiana. Brittany Trumbaturi, right, prepares to leave her flooded home with family member Joshua Barbot, center, who came to rescue family members in a boat. 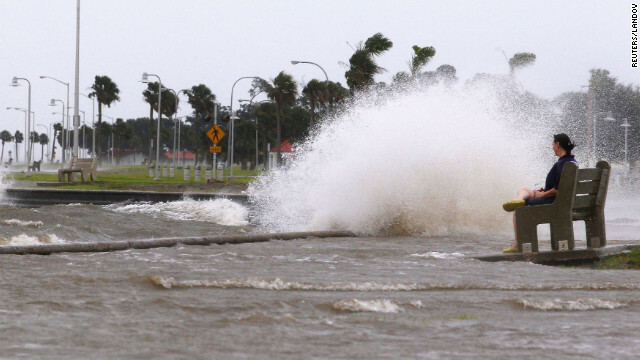 Officials warned of continued threats from storm surges and flooding as Isaac moved inland. 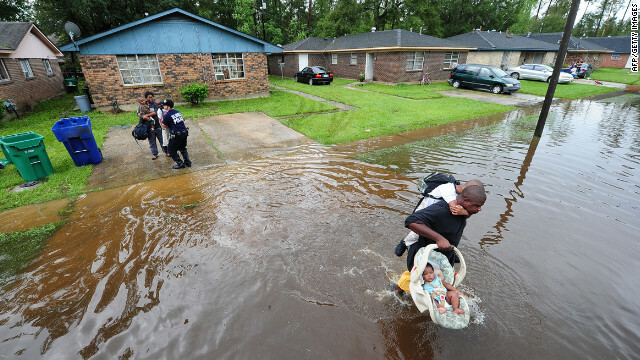 Jamaal Nelson carries his son, Jon-Wesley, 6, on his back and his 4-month-old baby daughter, Jalashia, while being evacuated from their flooded neighborhood in Slidell. 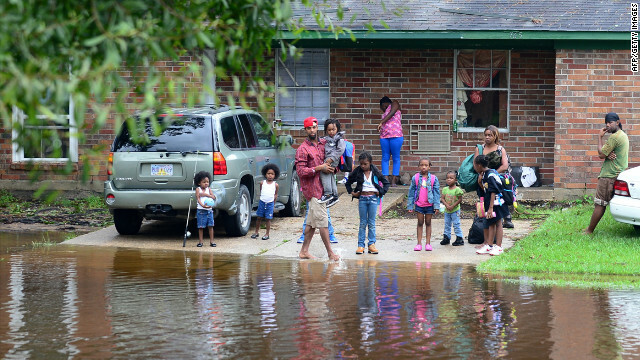 Residents stand in front of their home as flooded streets engulf their neighborhood in Slidell. 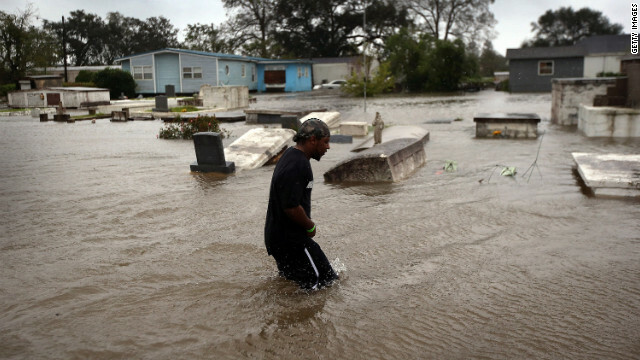 A resident evacuates an area flooded by Hurricane Isaac's storm surge on the north shore of Lake Pontchartrain. 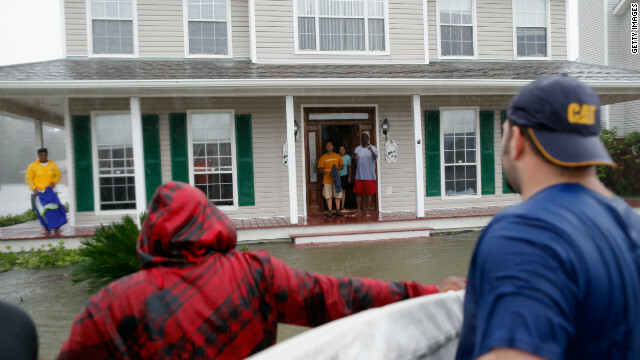 Residents evacuate their flooded neighborhood. 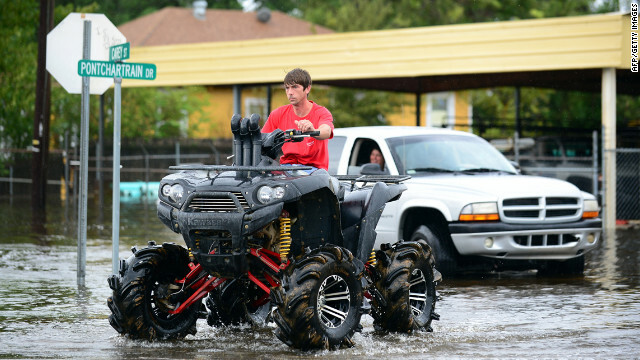 A man drives an off-road vehicle through flooded streets in Slidell. 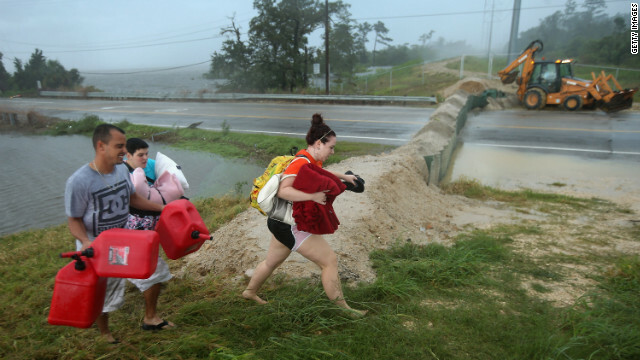 Residents carry pillows, blankets and fuel containers past a flood berm while evacuating an area of rising floodwaters on Thursday in Slidell. 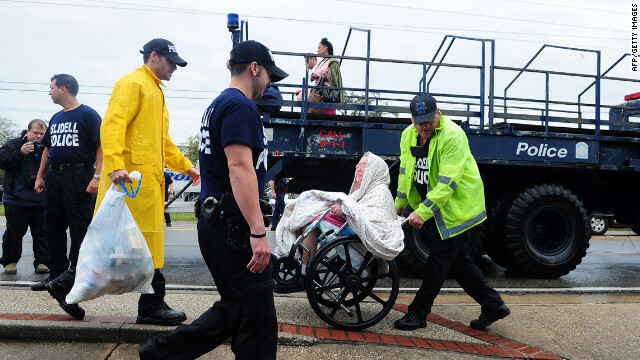 An elderly resident is rescued from her home in Slidell. Residents run down a road in Slidell clutching their belongings as they evacuate an area of rising floodwaters from Isaac's rains. 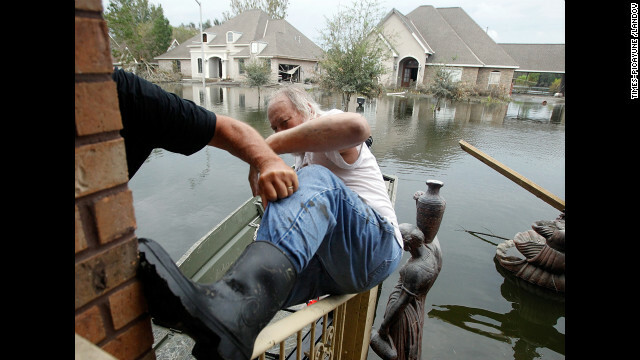 Rescue workers transport residents trapped by rising water from Isaac in Laplace, Louisiana, on Wednesday. 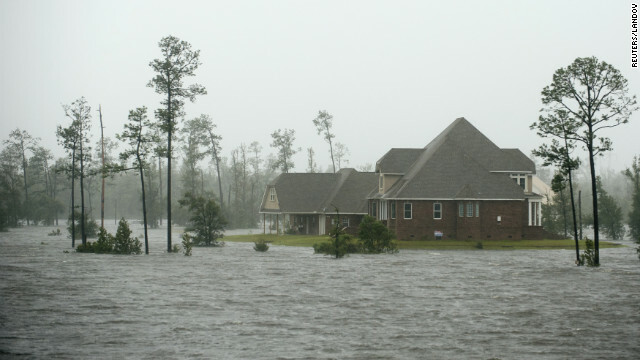 Water surrounds a home on the Jourdan River in Kiln, Mississippi, as Isaac moves through the area. 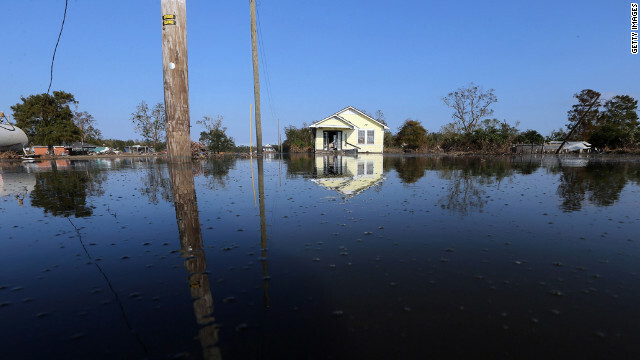 Residents are rescued Wednesday in Laplace, about 25 miles northwest of New Orleans, where the storm surge was unusually bad. Henry Cox talks with stranded residents in Laplace. Errol Ragas walks past a cemetery to recover dry blankets from his home as rising waters flood in Oakville, Louisiana. 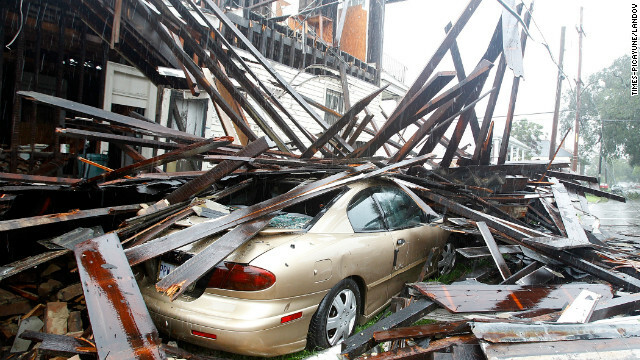 Plaquemines Parish, south of New Orleans, was the area most heavily damaged by the hurricane. 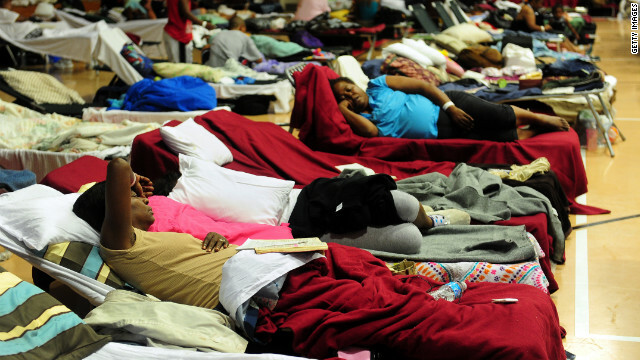 Storm-weary residents take refuge at a high school gymnasium in Belle Chasse, a low-lying area outside of New Orleans. 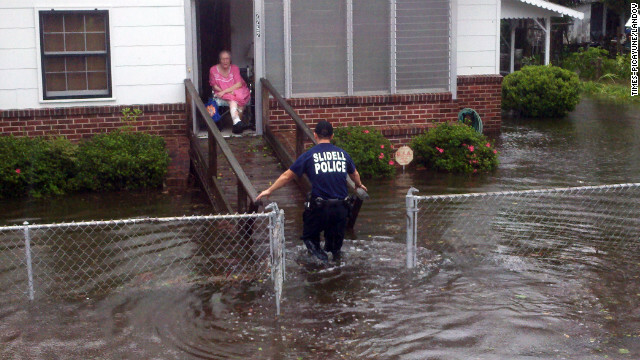 St. John Parish Sherriff officials rescue local residents from the flood waters in Laplace. Lisa, Christopher and Leroy Smith sit in a boat after being pulled from the flood waters. 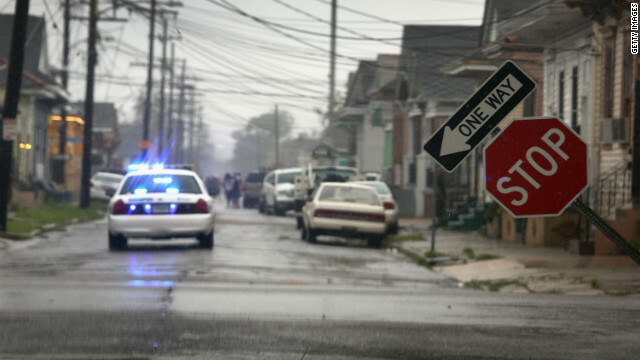 A stop sign stands askew in New Orleans after being blown by Isaac. 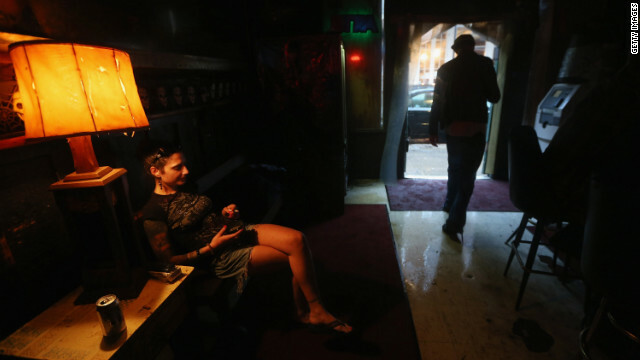 People gather at a bar in the French Quarter during ongoing rain from Isaac. The area appeared largely unscathed by the storm. 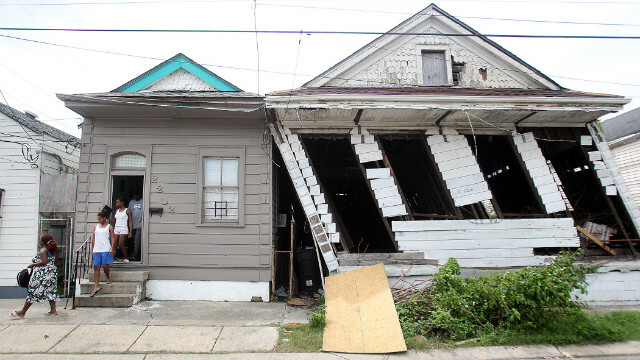 A house in New Orleans collapsed during the height of Hurricane Isaac, destroying three vehicles parked alongside it Wednesday. 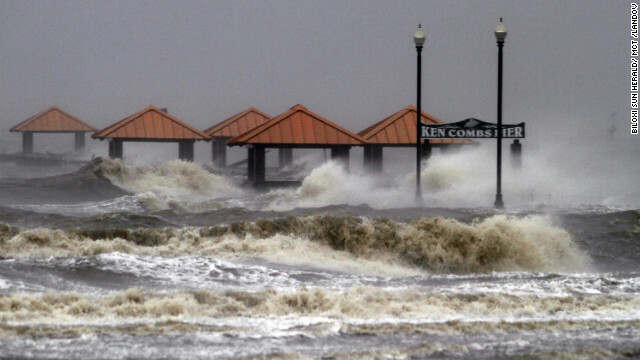 Waves from Hurricane Isaac pummel Ken Combs Pier in Gulfport, Mississippi. A street sign turned upside down, likely the result of bricks falling overnight from a building along the deserted streets of New Orleans. 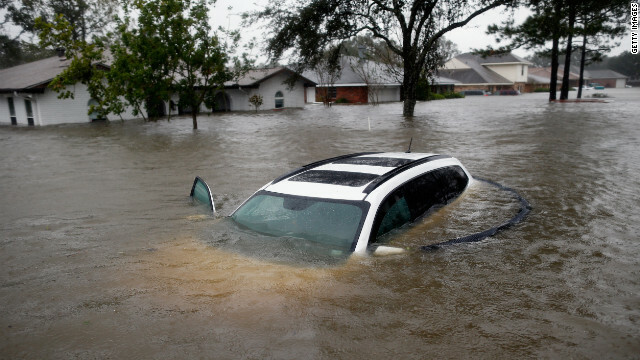 A car sits submerged in Laplace, Louisiana. 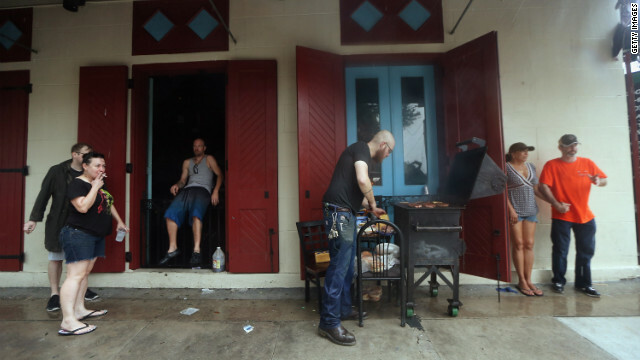 People gather beneath an awning for an impromptu cookout at a bar that lost electricity during Hurricane Isaac in New Orleans. 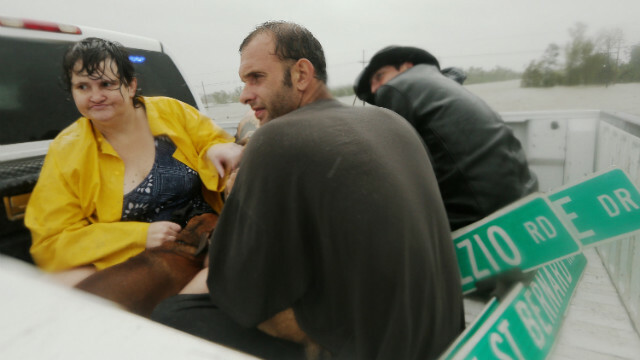 Emergency crews and residents rescue a dog during Hurricane Isaac on Highway 39 separating Plaquemines and St. Bernard parishes on Wednesday, August 29, in Louisiana. 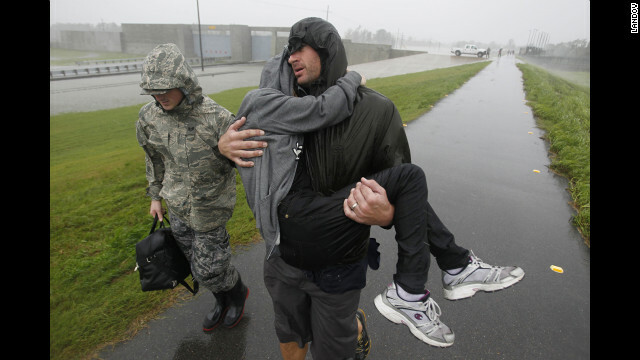 First responders carry people across the top of the levee from Plaquemines Parish to St. Bernard Parish. Mark Savoie cleans Espanade Avenue in New Orleans of tree debris to help the area near Burgundy drain as Isaac slowly moves inland. 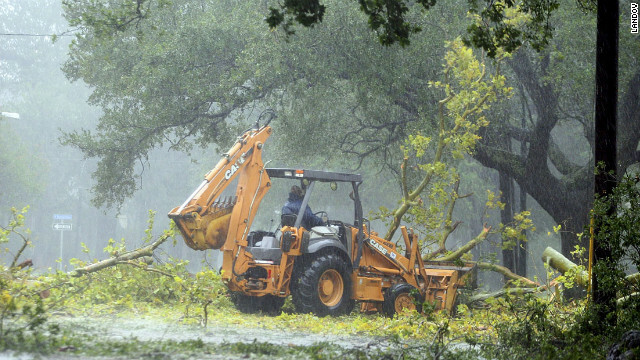 A worker in the driving rain tries to clear fallen limbs in the riverbound lanes of Espanade Avenue near McDonogh High School in New Orleans. 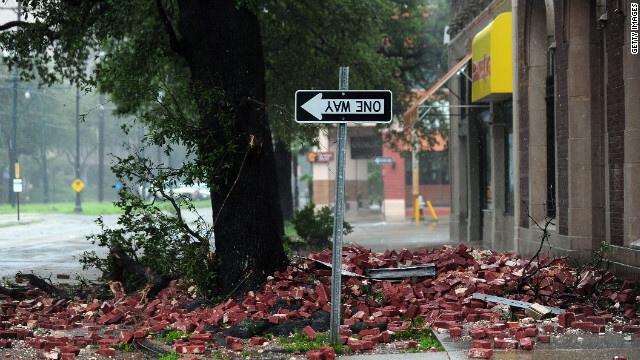 Winds from Isaac knocked down tree branches in Kenner, Louisiana. 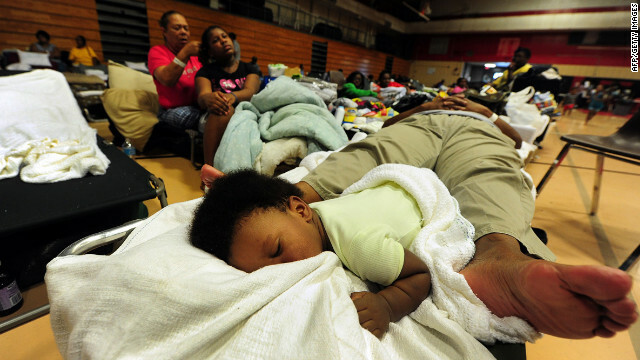 A child and an adult share a folding bed as storm-weary residents take refuge at a high school gymnasium in Belle Chasse, in low-lying Plaquemines Parish, outside of New Orleans. 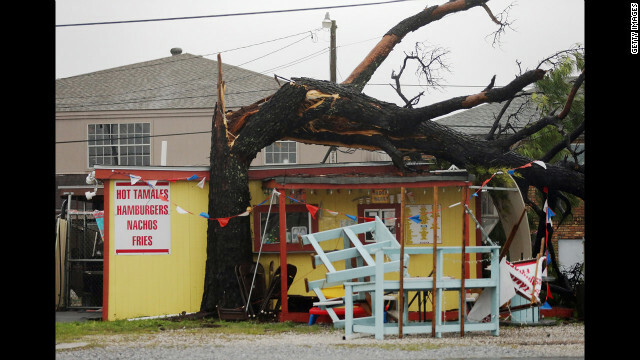 A tree toppled by Isaac stretches across the roof of a food stand in Arabi, Louisiana. 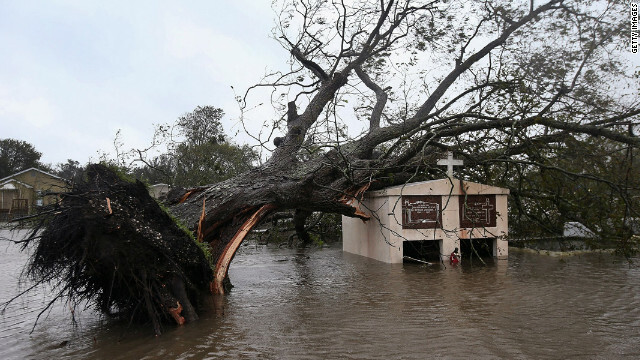 A tree blown over from Hurricane Isaac lies atop a cemetery tomb in Plaquemines Parish. 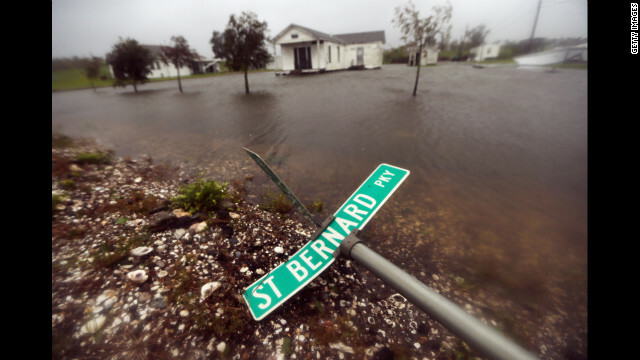 A street sign lies near floodwaters fromIsaac on Wednesday, in Braithwaite, Louisiana. 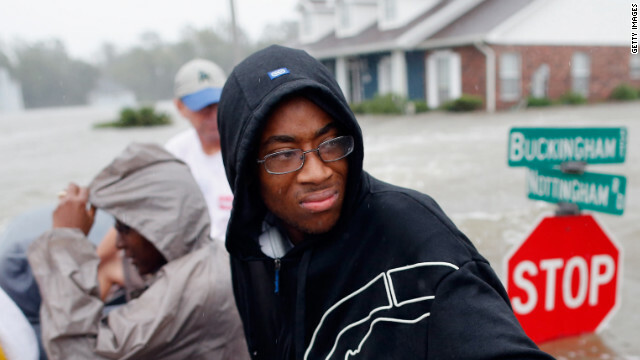 Dozens were reportedly rescued in the area after levees were overtopped by floodwaters from Hurricane Isaac. 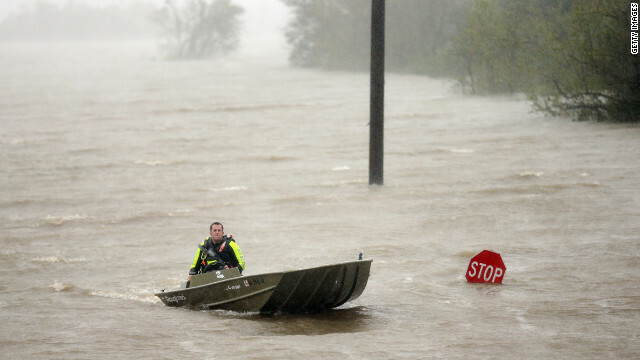 A rescue boat passes a partially submerged stop sign. A car drives down Canal Street on Wednesday. The storm is slowly moving across southeast Louisiana, dumping large amounts of rain and knocking out power in scattered parts of the state. 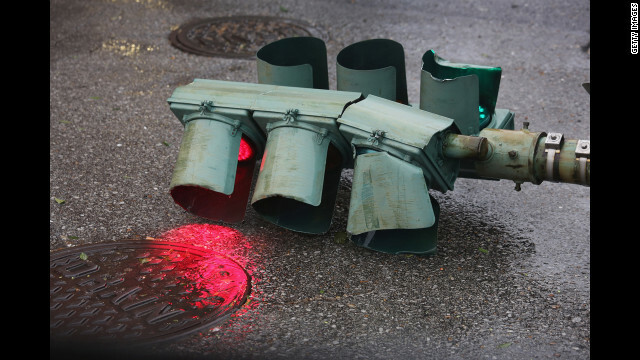 A traffic light continues to glow after being downed by Isaac's winds. 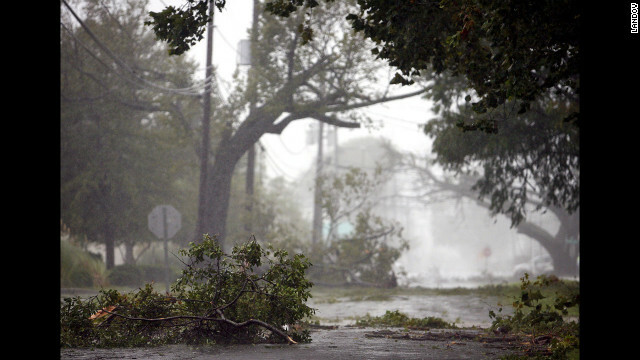 A fallen tree blocks a road in New Orleans as Isaac batters the city and surrounding region, flooding homes and driving stormy waters over the top of at least one levee. 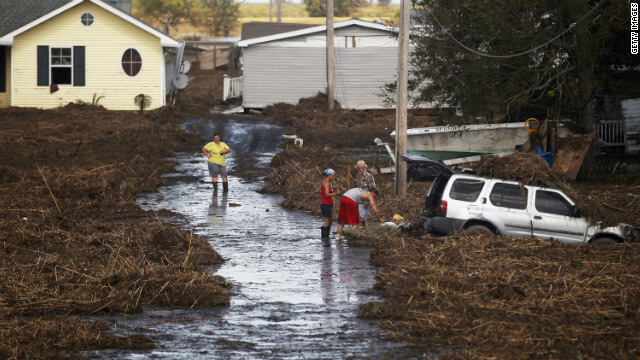 Dozens were reportedly rescued in Plaquemines Parish after levees were overtopped by floodwaters. 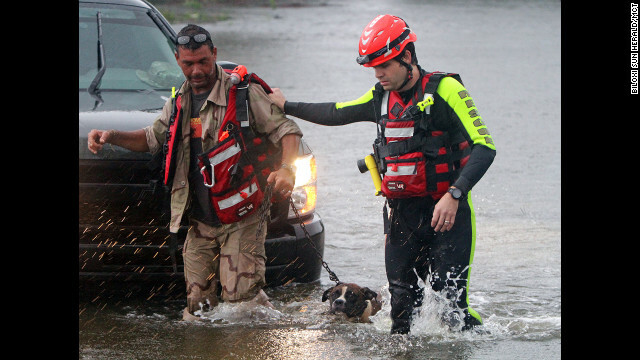 John Stone of Bay St. Louis, Mississippi, and his dog are led out of the water by a member of the Swift Water Rescue Team after being rescued from his flooded house. 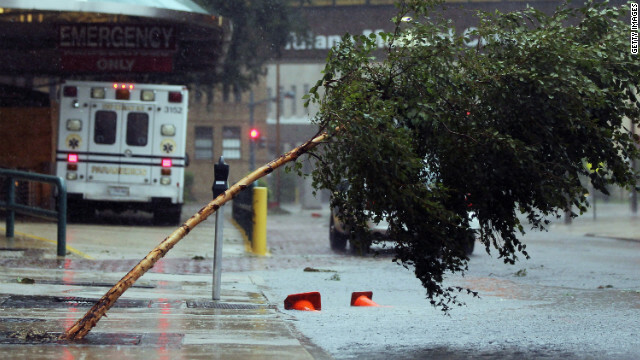 A tree was pushed over outside Tulane Medical Center in New Orleans. 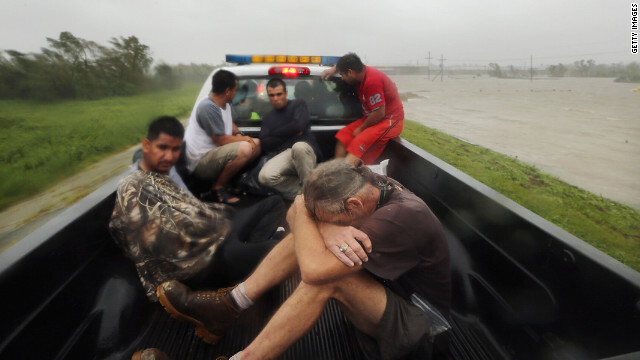 People rest in a rescue truck atop a levee in Plaquemines Parish. 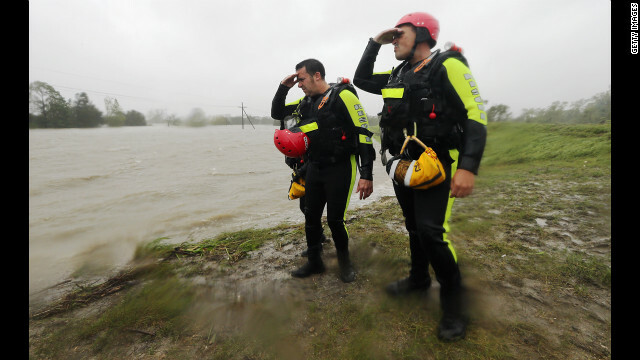 Rescue workers survey the floodwaters from a levee in Braithwaite. 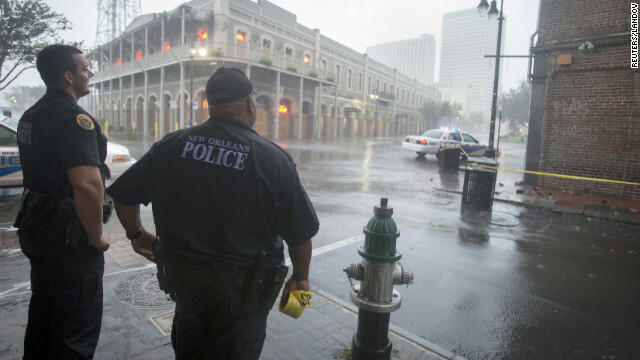 Police officers stand watch in the French Quarter. 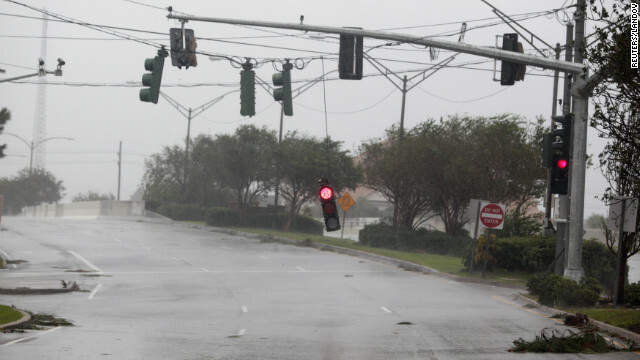 Isaac pounds Gulf CoastA traffic light dangles at an intersection in Metairie, Louisiana, during strong wind and rain as Hurricane Isaac pushes ashore. 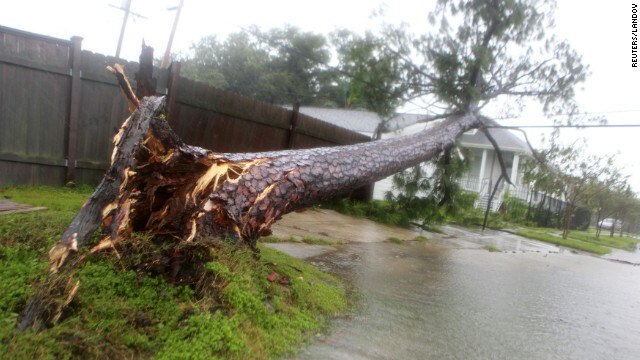 A tree toppled by hurricane-force winds lies on power lines near a home in New Orleans. 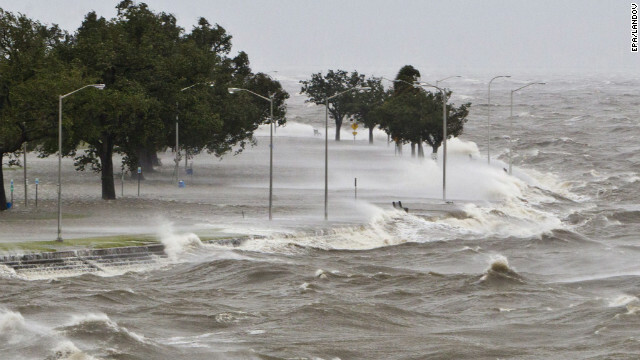 A storm surge causes water to quickly rise while waves pound the concrete seawall along the shores of Lake Pontchartrain in New Orleans on Tuesday, August 28. 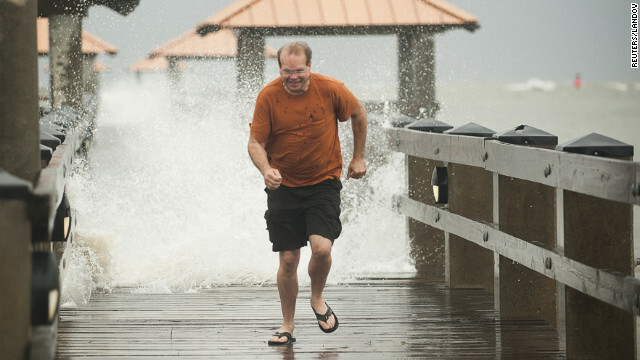 Scott Burley runs from crashing surf on the Ken Combs Pier in Gulfport, Mississippi. 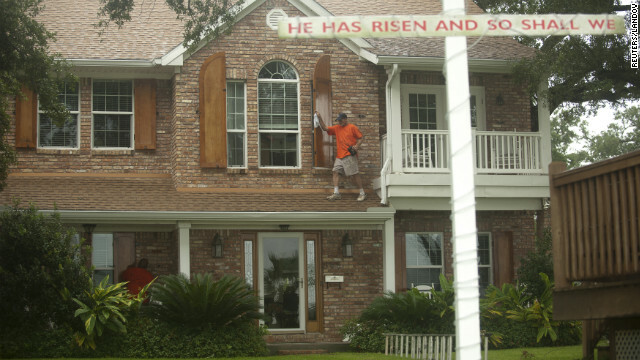 Jason Preston closes shutters on a home in Gulfport, Mississippi, as Hurricane Isaac approaches. 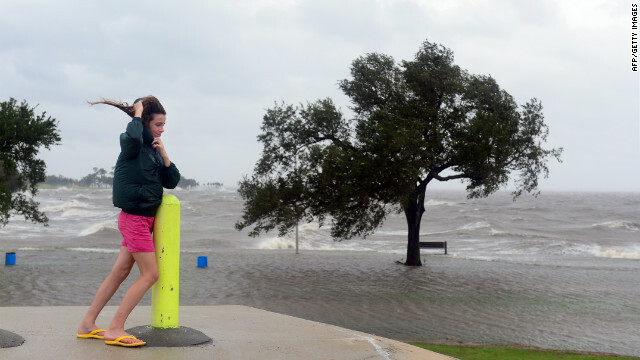 Emily Schneider leans against a pole to support herself against strong winds while visiting the banks of Lake Pontchartrain in New Orleans, where Hurricane Isaac has made landfall. Water rises from a bayou, flooding properties ahead of the arrival of Hurricane Isaac in Bay St. Louis, Mississippi. 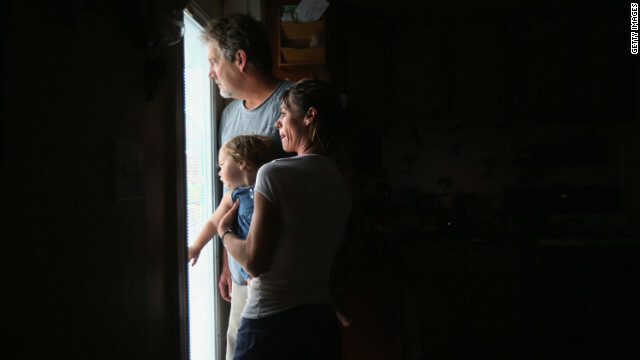 Bridgette Mooney, her husband Kevin, and their 15-month-old daughter Skyler watch from their home as Hurricane Isaac lashes their property with rain in Kiln, Mississippi. 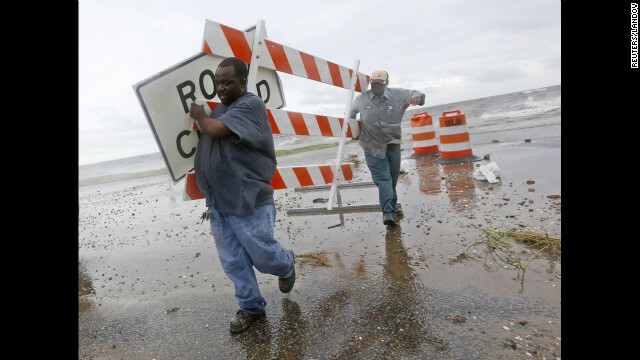 Employees of the Orleans Levee District remove signs from Lake Shore Drive near the shore of Lake Pontchartrain. 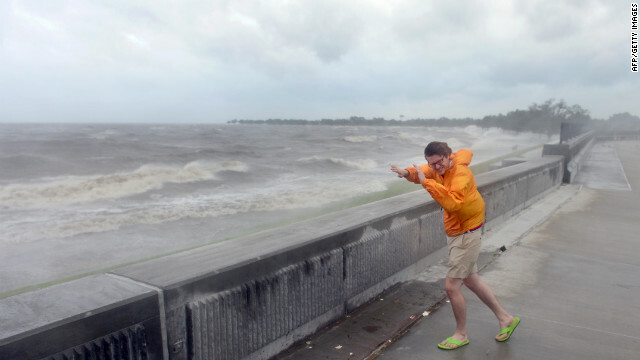 Evan Stoudt faces strong winds from the banks of Lake Pontchartrain. A man walks on Canal Street in New Orleans. Joshua Keegan and Ruffin Henry swim at Lake Pontchartrain. 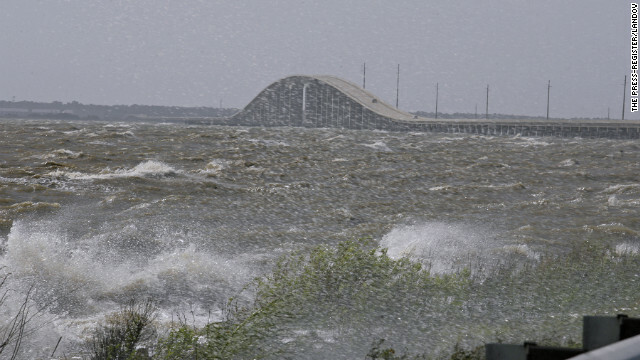 High surf splashes along Highway 193 north of the Dauphin Island Bridge in Alabama. 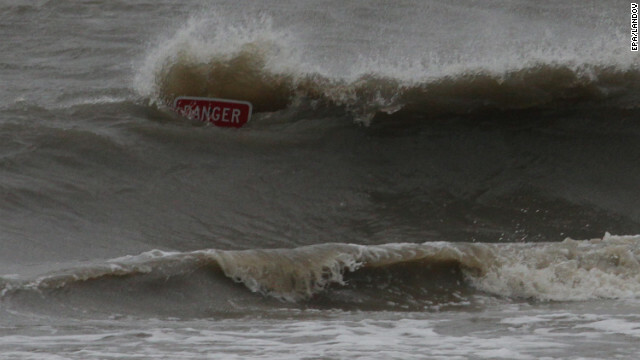 Waves from Hurricane Isaac smash against a warning sign at a flooded beach in Biloxi, Mississippi. 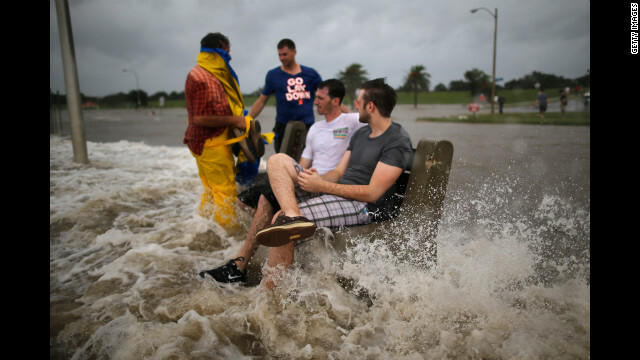 A group of men sit on a bench at the edge of Lake Pontchartrain as Hurricane Isaac approaches. 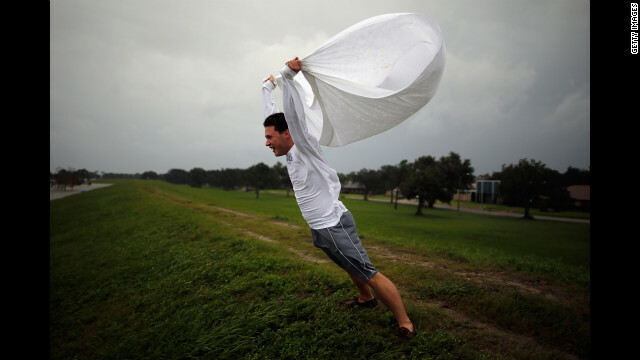 Matthew Pettus holds a sheet open in the wind on the levee near Lake Pontchartrain. People make their way across Canal Street in New Orleans. 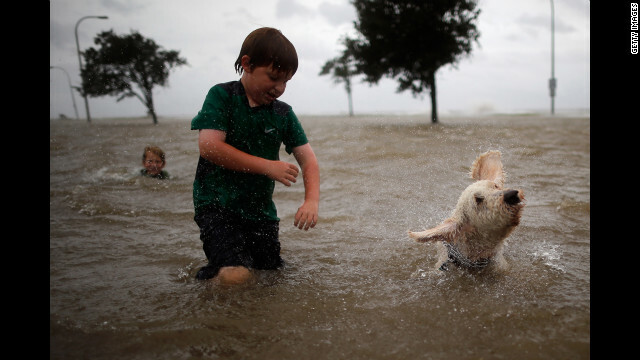 Joshua Keegan and his dog Scout swim in the rising water of Lake Pontchartrain. 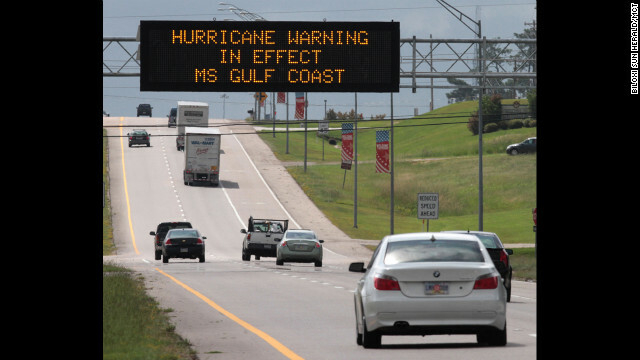 A Mississippi Department of Transportation sign in Hattiesburg warns southbound motorists on U.S. 49 of rough weather conditions on Tuesday, August 28. Hurricane Isaac is expected to drop heavy rain on the Mississippi Coast over the next couple of days. 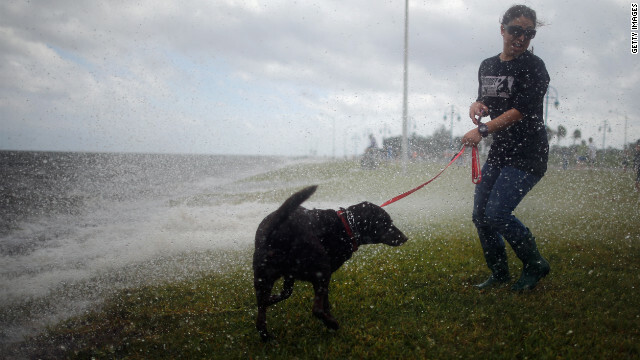 A woman and her dog watch the waves produced by Hurricane Isaac on the shore of Lake Pontchatrain in New Orleans on Tuesday. 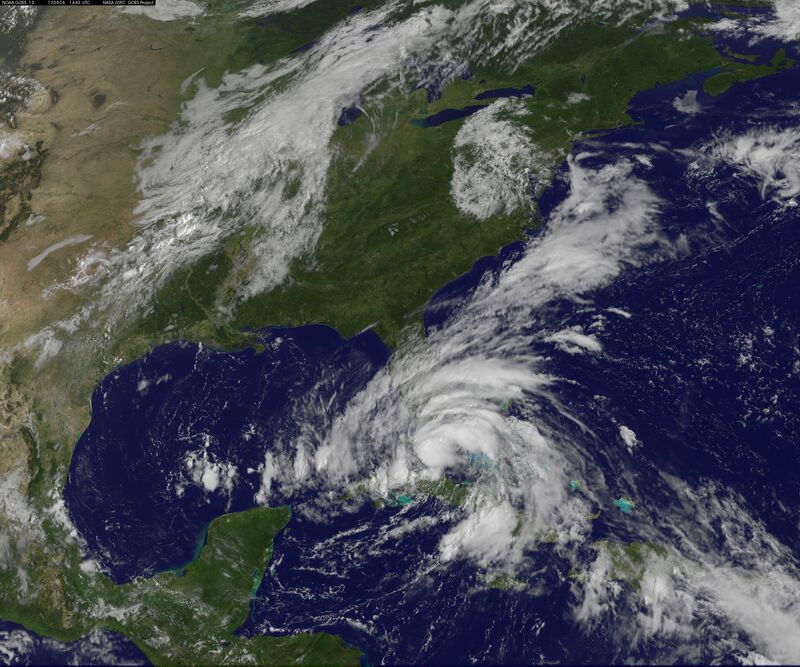 Hurricane Isaac is expected to make landfall later tonight along the Louisiana coast. Louisiana Gov. 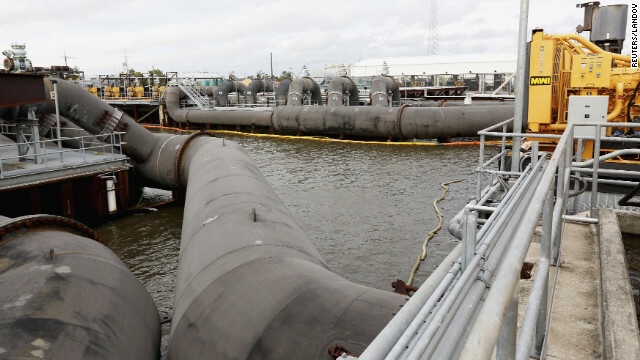 Bobby Jindal and New Orleans Mayor Mitch Landrieu receive an update on the status of the pumping station at the 17th Street Canal in Metairie, Louisiana. A couple takes photos in Bay St. Louis, Mississippi. Many residents of the area decided to stay in their homes instead of evacuating. 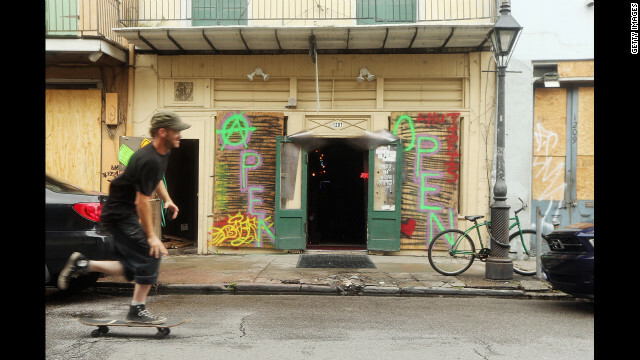 A man skateboards past a bar with boarded windows in the French Quarter in New Orleans. 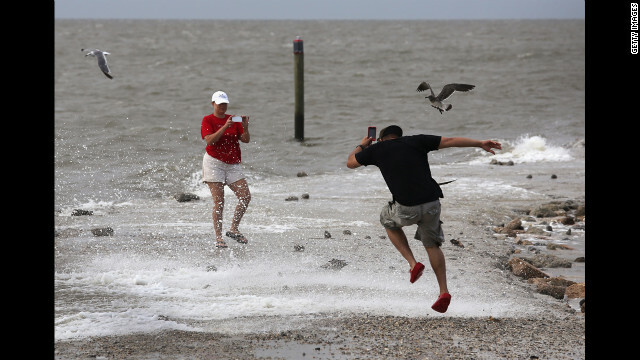 Diana Whipple of New Orleans watches waves crash on the shore of Lake Pontchartrain as Hurricane Isaac approaches Tuesday. Isaac became a Category 1 hurricane Tuesday when its maximum sustained winds reached 75 mph, the National Hurricane Center says. 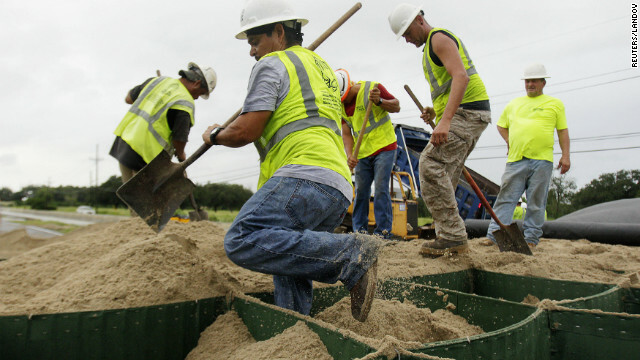 Workers try to close off state Highway 23 South in Oakville, Louisiana, on Tueday as Issac heads toward the coast. Gallery Nine Forty in New Orleans' French Quarter notifies customers it's "on Hurrication." 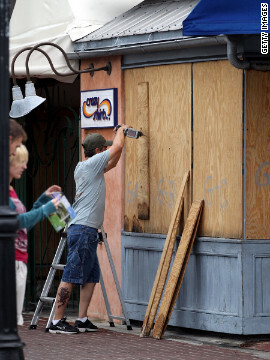 Workers board up a business on Bourbon Street in the French Quarter as Isaac approaches Tuesday. Hydraulic pumps are prepared at the 17th Street Canal floodwall Tuesday in New Orleans. 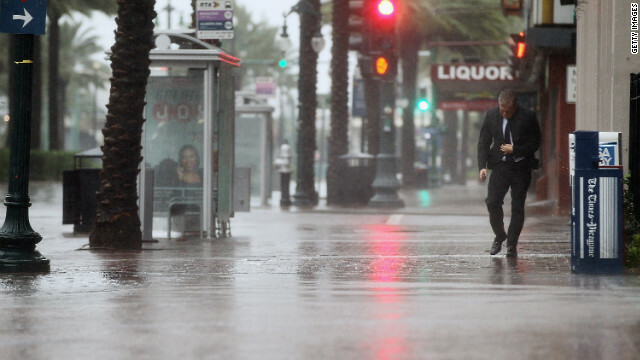 A woman enjoys the a heavy rain in the Tampa, Florida, area, on Monday. 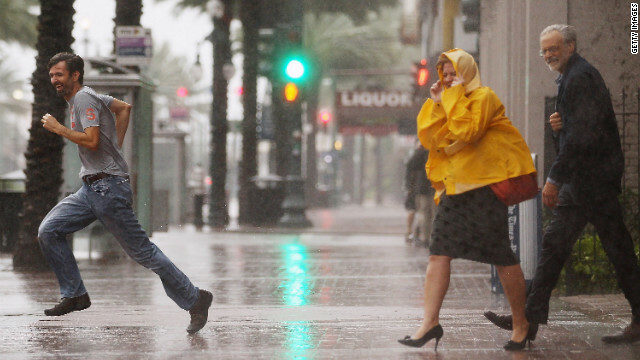 Hurricane Isaac is expected to make landfall near New Orleans. 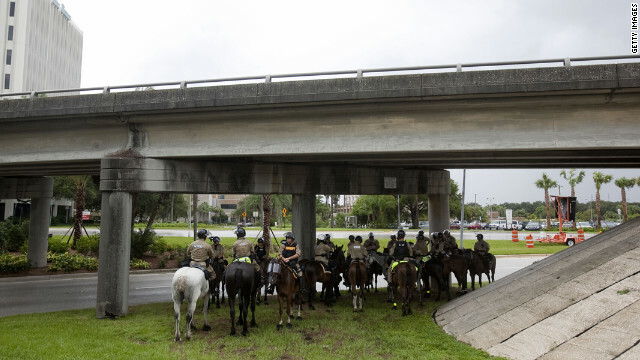 Mounted law enforcement officials wait out a brief rainstorm during the National Republican Convention. Commercial bus cancellations caused by Isaac prevented many of the expected demonstrators from being present. 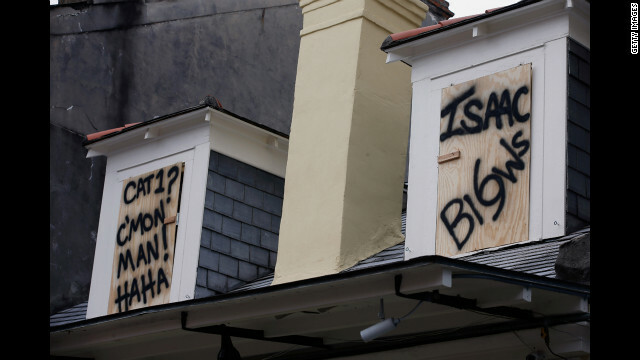 A sign in the French Quarter makes fun of Hurricane Isaac. 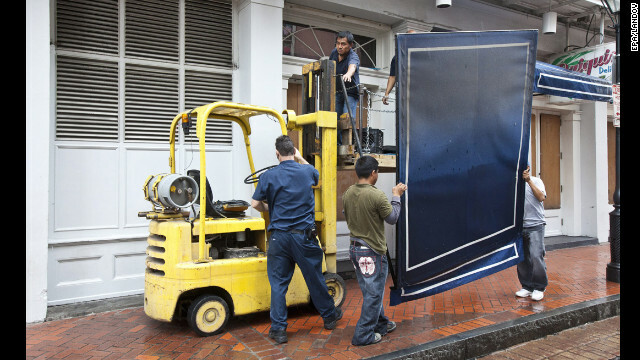 Workers place plywood on the windows of the Royal Sonesta Hotel on Bourbon Street. 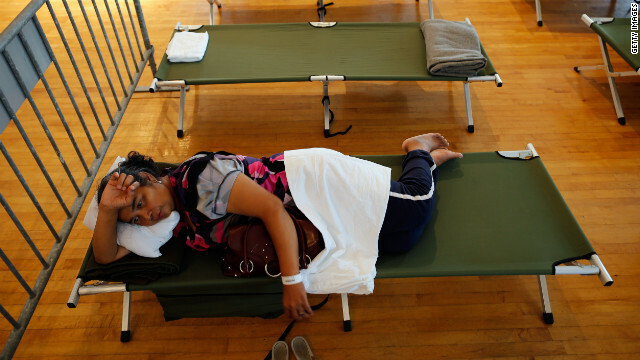 Aimo Ny rests on her cot in the hurricane shelter at the Belle Chasse Auditorium on Monday in Belle Chasse, Louisiana. 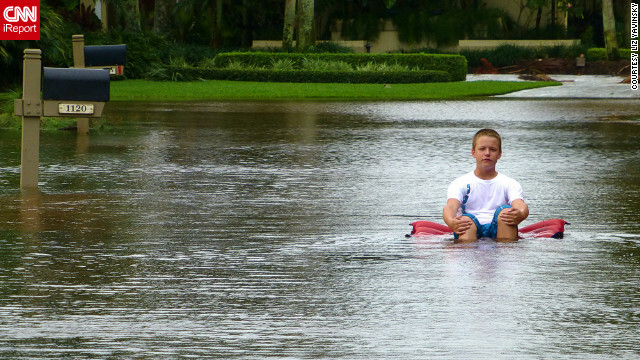 iReporter Liz Yavinsky snapped this picture of a boy floating down a flooded street in West Palm Beach, Florida, on Monday. 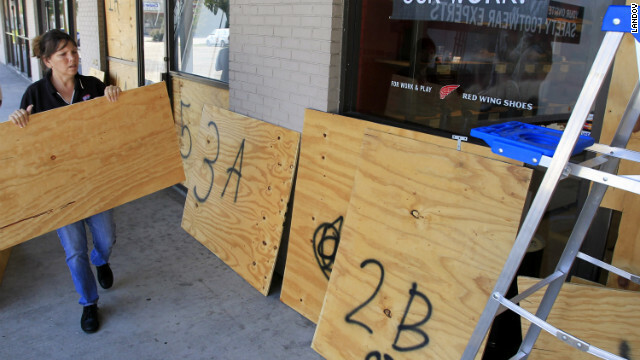 The manager of a shoe store in Harvey, Louisiana, places plywood over the windows in preparation of Hurricane Isaac. A crew from Jefferson Parish Drainage Department places large sandbags near a canal and pond in Jean Lafitte, Louisiana, on Monday in preparation for Isaac. 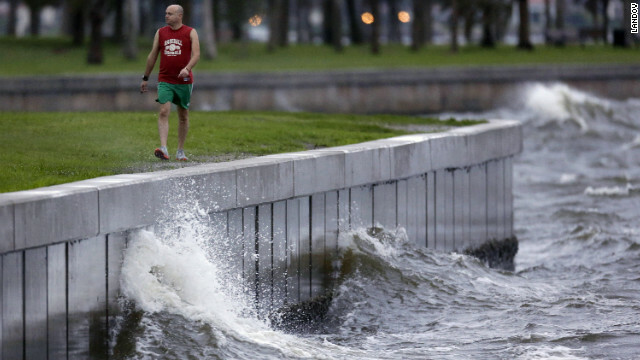 A St. Petersburg, Florida, resident walks along the sea wall at Spa Beach, where larger than average waves were being kicked up by Tropical Storm Isaac on Monday. 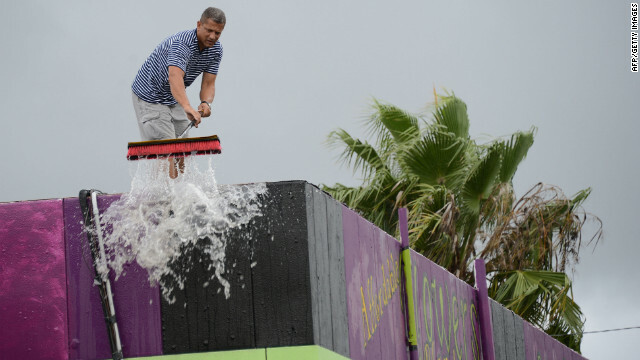 Oliver Marti sweeps water from heavy rains generated by Tropical Storm Isaac off the roof of his flower shop on Monday in Tampa, Florida. 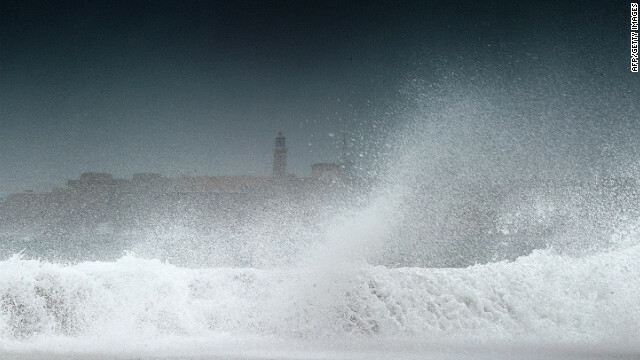 Waves batter the coast in Havana, Cuba, on Sunday after Tropical Storm Isaac passed the island. 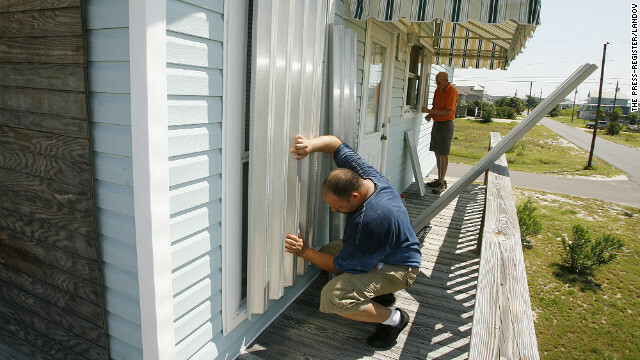 Larry Hoffmeister, left, and Charles Carter place storm shutters on Carter's vacation home on Dauphin Island, Alabama, as they prepare for Isaac on Sunday. Justin and Kayla Franklin of Tennessee walk in wind and rain in downtown Key West as Tropical Storm Isaac moves over the island. 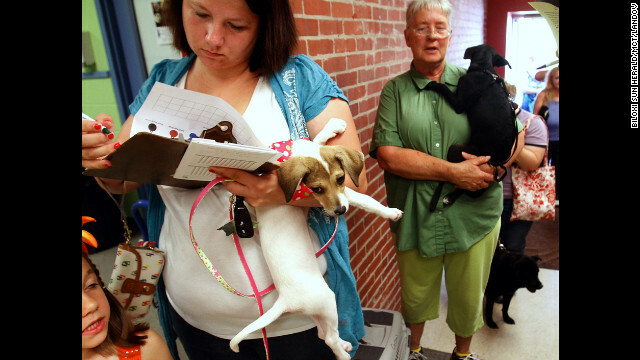 Biloxi, Mississippi, resident Stephanie Dale fills out paperwork Sunday to have her dog microchipped at the Humane Society of South Mississippi, which opened its doors to provide an emergency microchip and tag clinic. 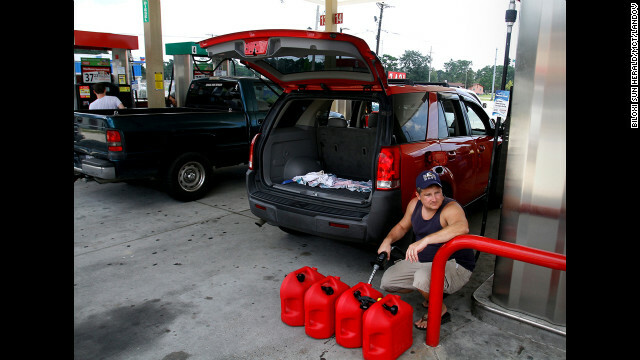 Ocean Springs, Mississippi, resident Charles Bartlett fills several gas containers in preparation for Isaac. 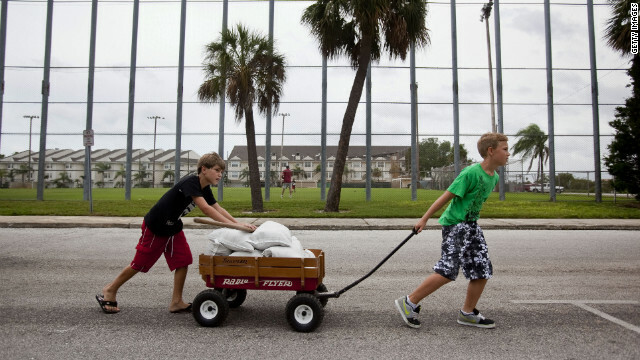 Andrew Marino, left, and Colby Collier pull a wagon filled with sandbags back to their homes as Florida residents prepared for Tropical Storm Isaac in St. Pete Beach, Florida, on Sunday. Palm trees blow in the wind in front of the Tampa Bay Times Forum, where the start of the Republican National Convention was pushed to Tuesday. 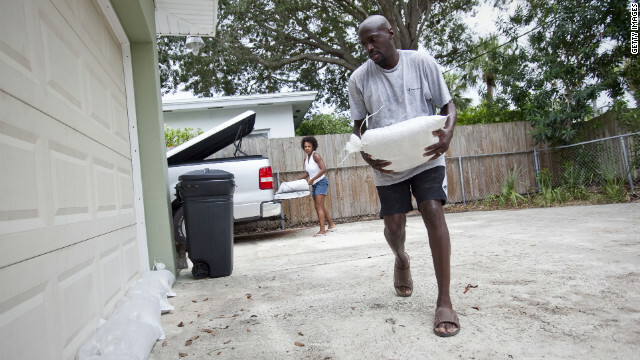 Earl, right, and Terri Harris place sandbags around their home to prepare for possible flooding. 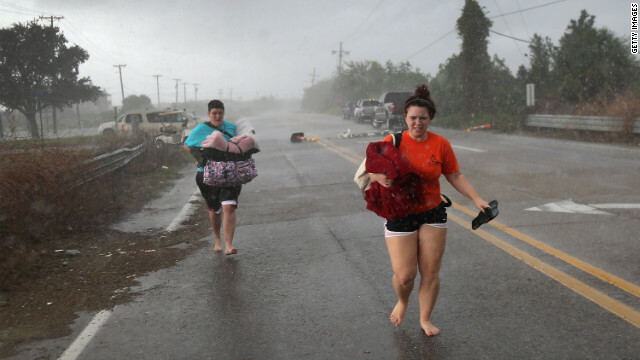 People venture out into the stormy weather as Tropical Storm Isaac passed by Marathon, Florida, on Sunday. 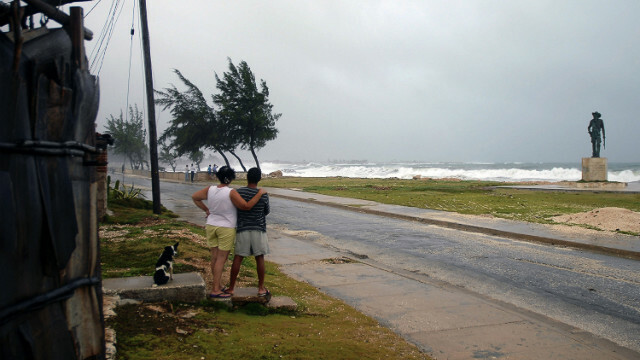 A couple watch as waves and strong winds from Tropical Storm Isaac, which crossed Cuba on Sunday, batter the shore in Gibara, Cuba, on Saturday. 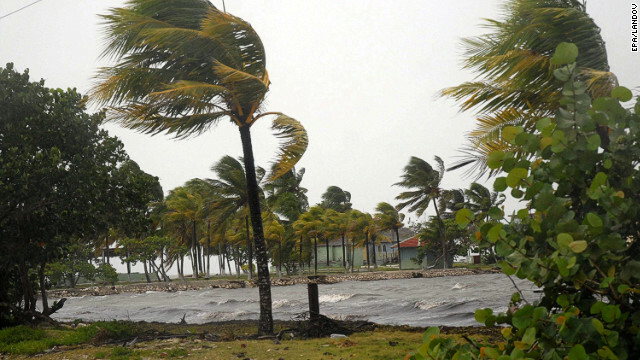 Strong winds bend palm trees in Cuba's northern province of Sancti Spiritus on Saturday. Isaac is expected to strengthen and become a Category 1 hurricane by early Monday as it draws nearer to Florida. 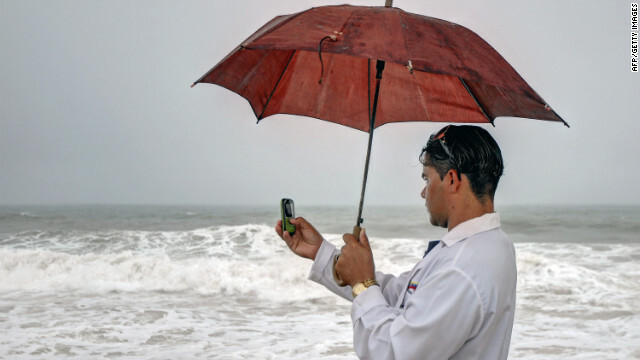 A man captures the effects of Tropical Storm Isaac in Gibara. People watch from the shore as waves pound the coast in Gibara. 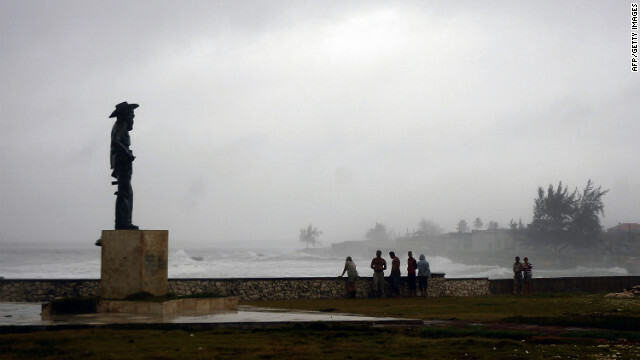 Officials reported some storm surge and flooding in eastern Cuba. 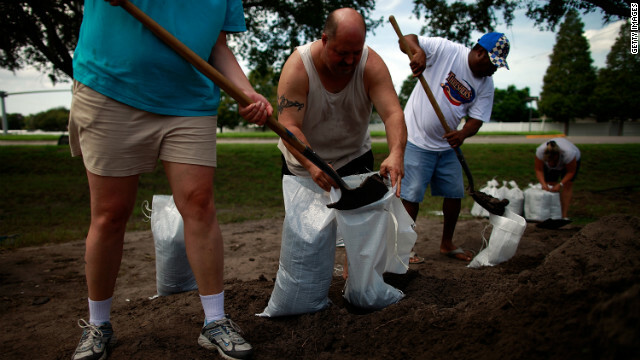 Tampa, Florida, area residents make preparations for the arrival of Tropical Storm Isaac by filling sandbags at a Hillsborough County Public Works Service Center on Saturday. 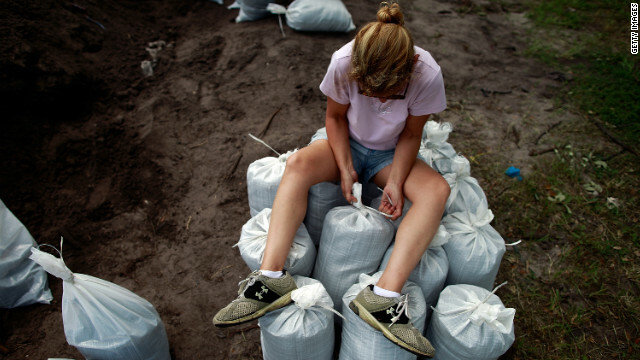 A woman sits atop sandbags filled by Tampa area residents in preparation for the storm. 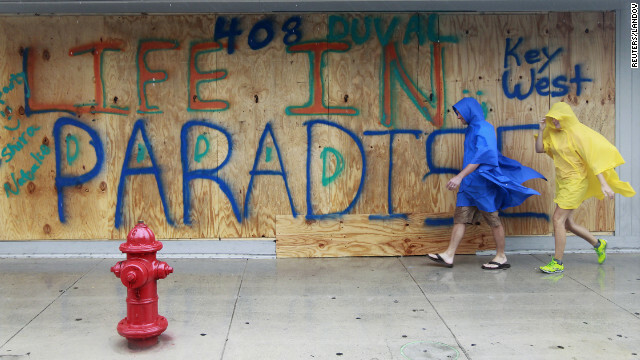 A Florida Keys resident boards up the windows of a store on Duval Street in Key West after a hurricane warning was issued ahead of Tropical Storm Isaac. 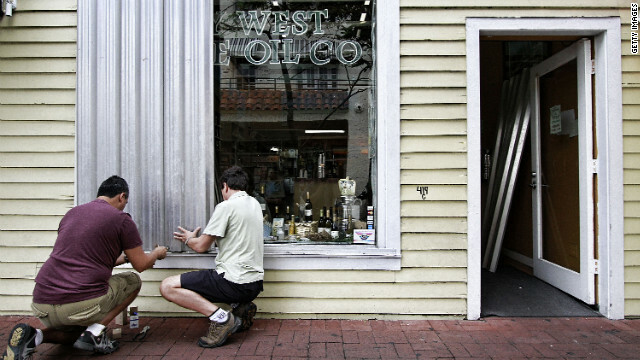 Two men install storm shutters on Duval Street on Saturday. 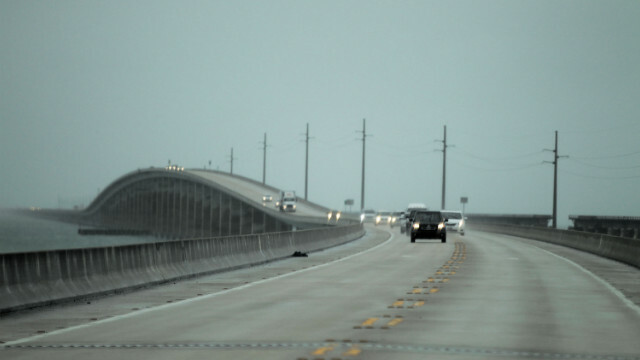 Vehicles cross a bridge leaving the Lower Keys on Saturday as the storm strengthens and moves closer. 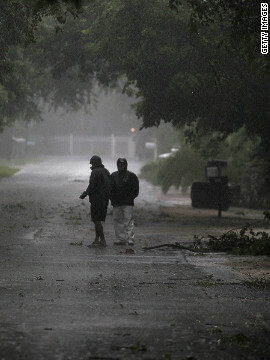 (CNN) -- Hurricane warnings blanketed much of the Gulf Coast on Monday as authorities across the region warned residents to be prepared for heavy rain, high winds and coastal storm surges. 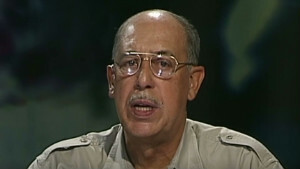 -- There will be no flights out of Louis Armstrong New Orleans International Airport on Tuesday, a city spokesman said. -- A spokesman for Baton Rouge Metropolitan Airport said there will be no flights on Wednesday. -- President Obama declared a state of emergency and ordered federal agencies to send aid and made federal funding available to the state. 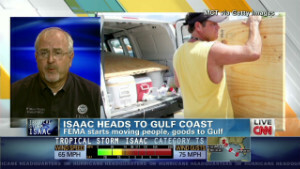 He put FEMA in charge of recovery operations. -- A hurricane warning is in effect from Morgan City east. -- A hurricane watch and tropical storm warning are in effect from Intracoastal City to Morgan City. -- A tropical storm watch is in effect for east of Sabine Pass to west of Intracoastal City. 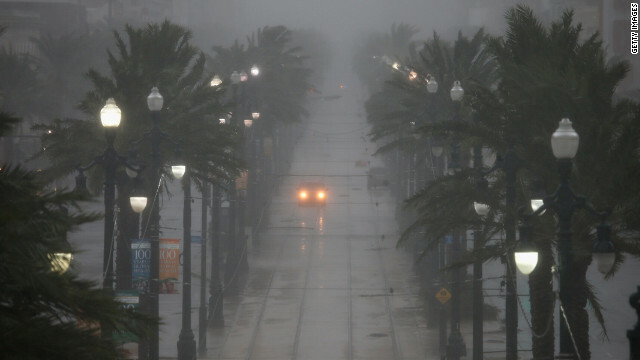 -- New Orleans authorities expect Isaac to hit the city as a Category 1 hurricane early Wednesday, with tropical storm-force winds arriving shortly after midnight Monday, Mayor Mitch Landrieu said. -- Landrieu did not issue an evacuation order for the city but urged people outside the city's protective levees to leave and told others, "If your plan is to go, now's the time to go." -- He acknowledged "a higher level of anxiety" because of Wednesday's anniversary of Hurricane Katrina, which killed nearly 1,800 people on the Gulf Coast in 2005. But he added that "We are prepared for what this storm is going to bring us at this point in time." -- More than 4,100 National Guard troops were activated Monday. -- Louisiana Gov. 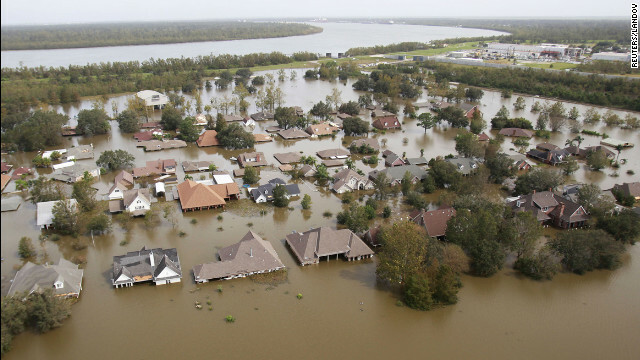 Bobby Jindal has called for residents in coastal parishes prone to flooding to voluntarily leave. 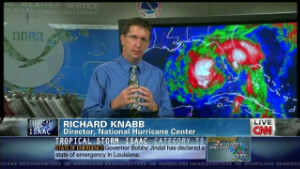 -- A total of 23 parishes have declared states of emergency ahead of the storm, Jindal said Monday. -- Mandatory evacuations have been ordered for St. Charles Parish and parts of Jefferson Parish and Plaquemines Parish. 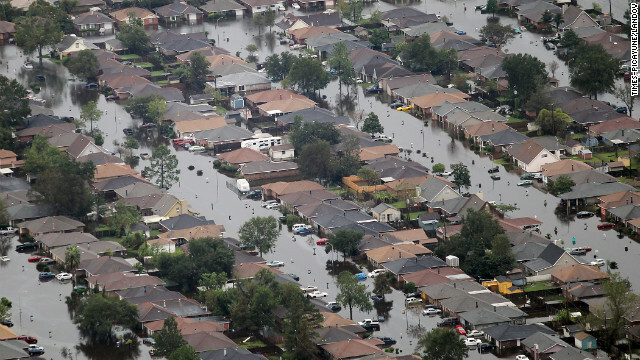 -- In Jefferson Parish, authorities ordered about 9,000 people to evacuate the towns of Jean Lafitte, Crown Point and Barataria. -- Jindal confirmed he will skip this week's Republican National Convention in Tampa, Florida, because of the storm. 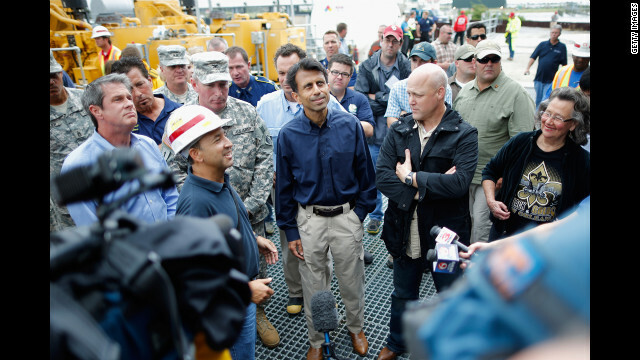 Jindal also had to cancel his 2008 appearance at the RNC because of another storm, Hurricane Gustav. -- The east bank of Plaquemines Parish, as well as the lower end of the west bank from Ironton to Venice, are also under mandatory evacuation orders. 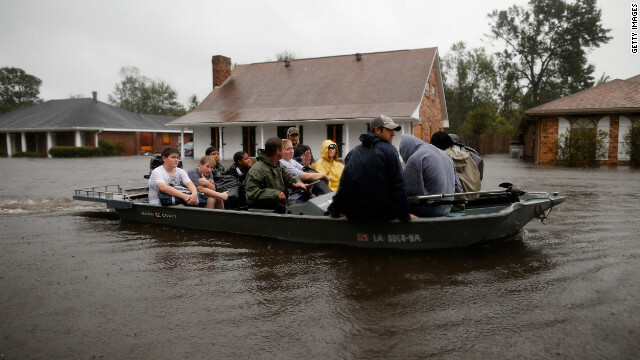 -- In St. Charles Parish, buses are being used to move residents. Evacuees may bring one personal item, one carry-on and pets. -- Widespread power outages are expected (a "100% certainty"), said Scott Whelchel, director of the St. Charles Parish Emergency Operations Center. 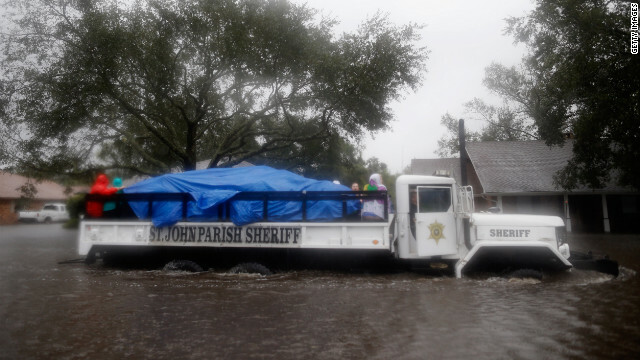 -- As of Monday morning, there were no plans to order evacuations of New Orleans, but officials say they will use buses and trains to move residents out of the area if needed. 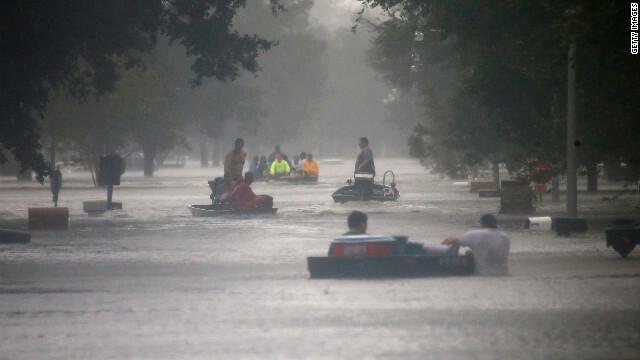 -- Louisiana State University, which has its first home football game of the season against North Texas on Saturday, says it plans to play as scheduled but will monitor the effects of the storm. -- Crews have been evacuated from 346 production platforms and 41 drilling rigs in the Gulf of Mexico as of Monday, meaning an estimated 78% of oil production in the region has been halted. -- Mandatory evacuations began in the low-lying coastal areas of Hancock County, which includes Bay St. Louis and Waveland. -- Gulfport-Biloxi International Airport will close Tuesday at 11 a.m. (noon ET). -- A hurricane warning is in effect for the entire coast. -- Gov. Phil Bryant has dispatched 1,500 National Guard troops to the state's three coastal counties to help local authorities. 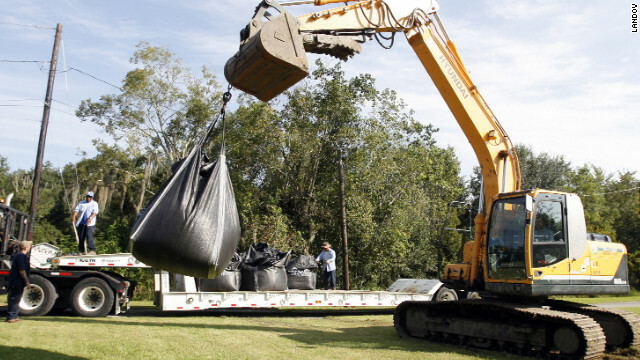 -- Mississippi has distributed 10,000 sandbags to residents to help prepare for flooding, Bryant said Monday. -- In Gulfport, authorities ordered the port cleared of cargo vessels. -- Cat Island and East and West Ship islands in Harrison County are closed because of the storm. 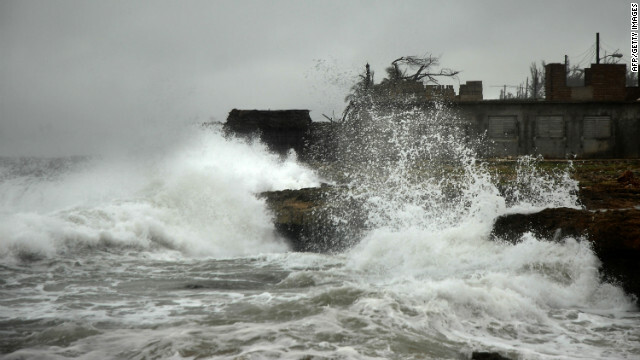 -- Alabama authorities warned residents Monday that strong winds and high water may affect the state's coast even if the storm hits as far west as Louisiana. -- Jeff Garmon, a forecaster at the National Weather Service station in Mobile, said the coastal counties on either side of Mobile Bay could see storm surges of up to 4 feet even if Isaac remains on its current course. -- Gov. Robert Bentley has ordered a mandatory evacuation for parts of Baldwin and Mobile counties. 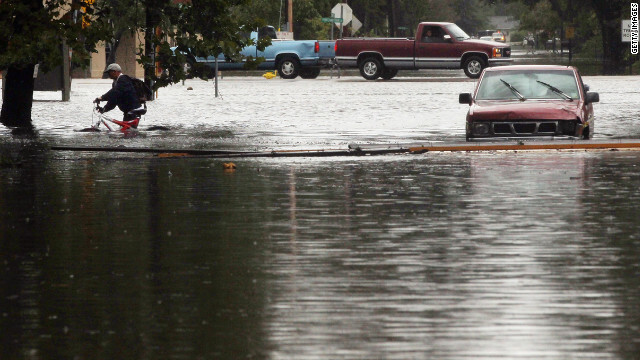 Other residents in low-lying or flood-prone areas are urged to leave voluntarily. -- The area could start feeling storm-force winds as early as Tuesday afternoon, Garmon said. -- Passengers flying out of Mobile Regional Airport on Tuesday should check to see if their flights have been canceled. -- Ten National Guard troops have been activated and others are standing by. -- A tropical storm warning is in effect from the mouth of the Aucilla River west to the Alabama border. -- Tropical storm-force winds are expected to start hitting the Florida Panhandle by Monday night, Gov. Rick Scott told reporters. 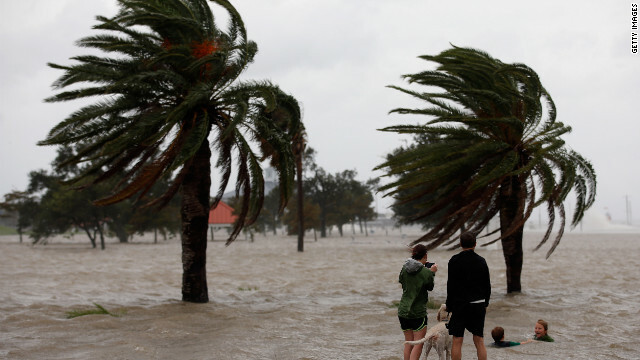 -- People living on the barrier islands of Perdido Key and Santa Rosa Island, near Pensacola, were ordered to evacuate, along with parts of downtown Pensacola and other low-lying areas. -- Pensacola International Airport was to close at midnight Monday. Almost 250 flights that would have originated in the state Monday were canceled. 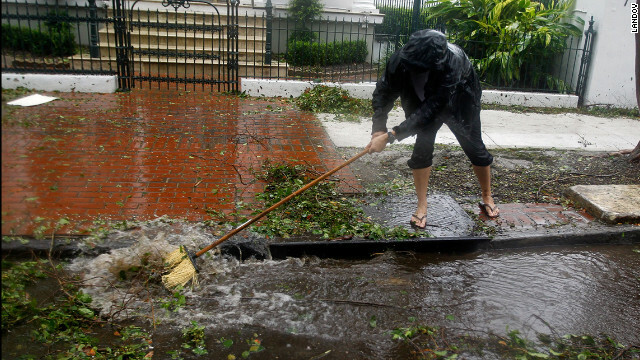 -- In Okaloosa County, which includes Fort Walton Beach, county officials called for voluntary evacuations of low-lying areas and offered sandbags to county residents. 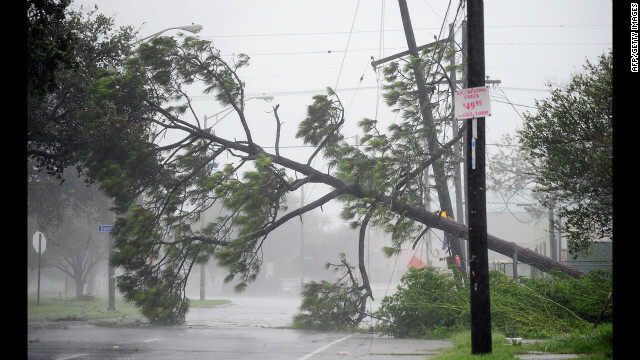 -- Isaac caused some relatively minor damage as it skirted south Florida, and 32,000 homes and businesses remained without power in Miami-Dade County, government spokeswoman Vanessa Santana-Renate said. 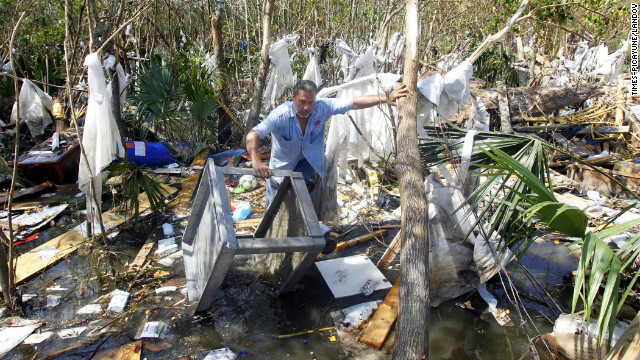 -- Thirty members of the Florida National Guard were activated, the governor's office said. -- Aircraft at six military bases have been relocated, the Defense Department said. -- Evacuation orders were lifted for southwest Florida's Lee County, including Fort Myers Beach, late Sunday. 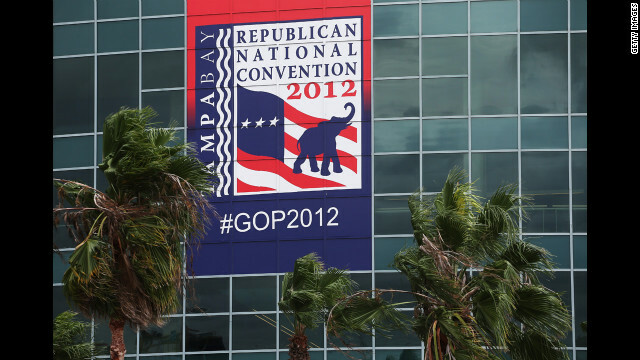 -- Organizers of the Republican National Convention in Tampa delayed the convention for a day as Isaac approached. Proceedings begin in earnest Tuesday.